Horizontal cells are the interneurons of distal vertebrate retina. They provide the pathways for both local and long range interactions between photoreceptors. These interactions are called feedback signals. Feedback signals adjust the gain of photoreceptor synaptic output, both as seen in the horizontal cells themselves and in the adjacent, proximally projecting bipolar cells. In forming a distal, lateral synaptic network, horizontal cells enrich not only their own physiology but that of presynaptic and postsynaptic partners. They generate spatial opponency in both cones and bipolar cells. They also generate color opponency in cones, bipolar cells, and chromatic horizontal-cell subtypes. The actions of horizontal cells propagate forward in the retina, can be identified in the physiology of retinal ganglion cells, and in visual perception. Horizontal cell actions are in turn tuned by neuromodulators released by other retinal neurons. 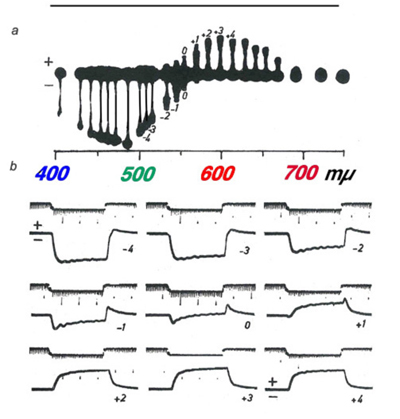 The first intracellular, light-evoked responses recorded in the vertebrate retina were slow, negative going changes in membrane potential that lasted for as long as the light stimulus was present (Fig. 1). Before the morphological source of these responses became clear, they were called simply S-potentials (1). As shown in figure 1, S-potentials are membrane hyperpolarizations that last for as long as the light stimulus is present. The graded character of the S-potential is evident in figure 1A. The brighter the stimulus, the larger the amplitude of the S-potential until a saturation level is reached. In figure 1B, the duration of a light stimulus of fixed intensity is altered in order to examine the temporal properties of S-potentials. For long stimuli, the S-potential only changes in duration but the amplitude remains constant (2 leftmost responses in Fig. 1B). Further reduction in the stimulus duration causes a decrease in amplitude (Fig. 1B). This illustrates the temporal summation of the S-potential, following Bloch’s law. Up to certain stimulus durations, in this case about 10 msec, the amplitude is directly related to the quantal content of the stimulus (quantal flux multiplied by duration), while for stimuli of longer duration, the amplitude is related to the quantal flux, that is, the rate of quantal absorption by photoreceptors (1). In S-potentials this ‘critical duration’ varies considerably with stimulus conditions (2). It is likely that S-potentials were named in honor of their discoverer, Gunnar Svaetichin, although ‘slow potential’ is another common interpretation. Figure 1. The S-potential of the fish retina. Light stimuli of fixed duration and different irradiances (A) and light stimuli of fixed irradiance but different durations (B) were used to elicit these potentials. Lower traces in A and B record light-stimulus duration and provide 100 msec ‘tick-marks’. The illustrations are from Svaetichin,1953 (1). S-potentials puzzled neurophysiologists of the 1950s when they were first described. At that time, neurons were thought only to be depolarized by synaptic inputs (inside becoming more positive relative to outside), thus having their inside-negative resting membrane potentials become reduced. This depolarization was thought of as excitation, and if the excitation was large enough, action potentials, or nerve spikes, were generated to transfer signals down the length of the nerve-cell axon. S-potentials, however, were not depolarized by light, but rather hyperpolarized, and did not fire action potentials, even with the brightest light stimuli. At first, the cell type of origin for S-potentials was not really known other than that microelectrode tips were somewhere in the outer retina. In fact, initially Svaetichin thought S-potentials arose from cones (1). However, later intracellular marking techniques, in which dyes were injected from the electrode tips into the cytoplasm of the recorded neuron, revealed that horizontal cells, second order neurons postsynaptic to cones, were the source of the S-potentials (3, 4). Since being first described in fish retinas, S-potentials have been recorded from retinal horizontal cells in all vertebrate classes. These include both cold-blooded vertebrates (4-13), household mammals (14-20) and primates (21-26). Horizontal cells have now been studied by numerous investigators using anatomical, biochemical, pharmacological and electrophysiological techniques. In this chapter, we shall try to summarize our current knowledge of horizontal cells in the vertebrate retina. 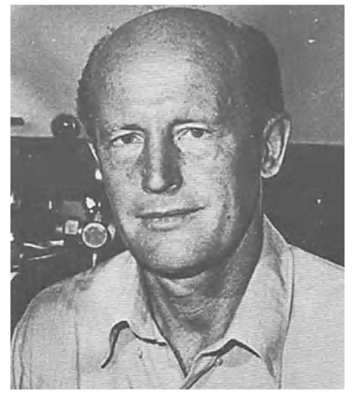 Gunnar Svaetichin (1915-1981) mastered high impedance microelectrode techniques while studying neurophysiology in the Karolinska Institute with Ragnar Granit (nobel prize, 1967). These enabled intracellular recording of light responses from retinal interneurons, a field that he founded. It was an imaginative area to pursue in the 1940’s. He is the discoverer of S-potentials, now known to be retinal horizontal cell responses, and discovered both color opponent and non opponent types. The discovery of neural color opponency ranks with the most significant findings in color vision in the 20th century (292). The later decades of his career were spent at the Venezuelan Institute for Scientific Research. Horizontal cells are second order neurons contacting photoreceptors directly all across the plane of the retina’s outer plexiform layer. These cell types were first described as huge brick-like structures occupying much of the inner nuclear layer in the fish retina (27, 28). Early interpretations assumed these cells to be glial cells, mainly because they gave rise to hyperpolarizing slow responses to light (S-potentials) rather than true depolarizing spikes like ‘real neurons’. Now we know horizontal cells to be true neurons that make true, if unique, synapses and exhibit most of the structural and ultrastructural characteristics of neurons. Through Golgi staining, intracellular marking and immunostaining techniques we have learned that horizontal cells can adapt various morphologies in the retinas of different vertebrate species (6, 29-44). There are two morphological types of horizontal cell in the majority of terrestrial vertebrate retinas, B-type cells with axons and A-type cells that are axonless (Fig. 2a). In mammals the dendrites of both B- and A-types contact cones, while the axon terminals of B-type cells contact rods (gray area, Fig. 1A). 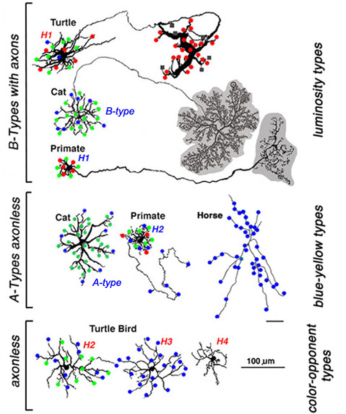 In birds and reptiles, horizontal cells come in further axonless subtypes with color specific cone connections (Fig. 2a, axonless). Figure 2a shows the morphologies of these different types of horizontal cells in different species as indicated. Also shown are the spectral types of cone (red, blue and green dots) that connect with each type. Figure 2a. The morphologies of different types of horizontal cell and their known connectivities with rod and cone photoreceptors. The cells are drawn from Golgi stained or Neurobiotin filled retinal cells and viewed in flat whole-mounted preparations. B-type cells with axons, and A-type axonless cells exist in most vertebrate retinas. The physiological type that is associated with each morphological type is indicated to the right of the figure, i.e luminosity, blue-yellow and color-opponent types. Red-, green- and blue-dots represent inputs from red-, green-, and blue cones respectively. Black squares or shaded gray areas represent rod inputs. The turtle H1 cell is from Ammermüller and Kolb, 1995 (84); H2-H4 are from Kolb et al., 1988 (293). The cat B-type is from Nelson et al., 1975 (17); the A-type is from Kolb, 1974 (294). Primate H1 and H2 types are from Helga Kolb not elsewhere published. The horse axonless horizontal cell is from Sandmann et al., 1996 (40). In fish retinas, short-axon or axonless horizontal cells (type H4) contact only rods (45, 46), while the dendrites of all axon bearing cells contact only cones (Fig. 2b). The axons of fish horizontal cells do not contact photoreceptors. 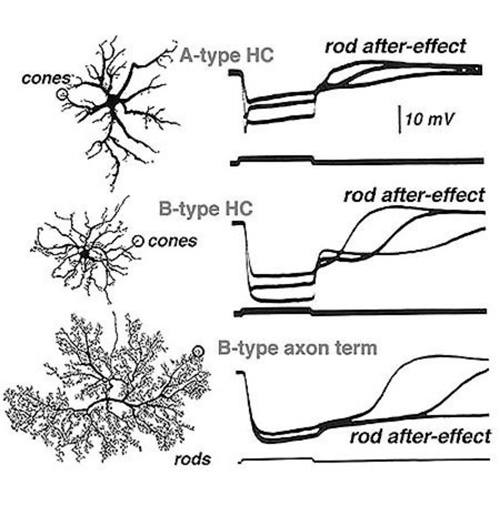 There are multiple types of axon bearing, cone-contacting, horizontal cells in fish (H1, H2, H3), each with different patterns of cone selectivity. In the zebrafish example (Fig. 2b), most are excited by 2 of the 4 cone types and avoid excitatory input from other types. The exception is the H3 UV triphasic type that appears to be selectively excited by either UV or blue cones. H2 and H3 types are color opponent in wavelength physiology, but H1 is not. Figure 2b. Cone contacts of H1, H2 and H3 horizontal cell types in zebrafish retina (A, B, C respectively). These neurons were back-labeled with DiI through crystals placed on their axons. Dendritic tips and spines contact cones, sometimes in clusters called ‘rosettes’. D. Zebrafish cones form a regular mosaic of red (R), green (G), blue (B) and ultraviolet (UV) types. The position of horizontal-cell contacts within the mosaic identifies the cone color type that is contacted. E. Summary of cone contacts for H1, H2 and H3 types. Black arrows are contacts proposed for feed-forward excitation, while gray arrows are contacts proposed for feedback inhibition. Except for the UV triphasic H3 cell, all horizontal cells are excited by 2 cone types. The figure is from Li, et al, 2009 (37), with physiological identifications based on Connaughton and Nelson, 2010 (6). Mammalian and reptilian B-type horizontal cells code changes in brightness but do not discriminate color. They regulate adaptational and spatial responses of cones and bipolar cells. These are luminosity type horizontal cells whose physiology will be discussed later. These B-Type cells can often be identified with antibodies against calcium binding proteins (47-49) and some contain the neurotransmitter GABA (47, 50, 51). In turtle retina, acetylcholine has been located in H1 type horizontal cell dendrites where they invaginate the cone pedicles (47). H1 type cells of turtles are morphologically analogous to mammalian B-type cells. 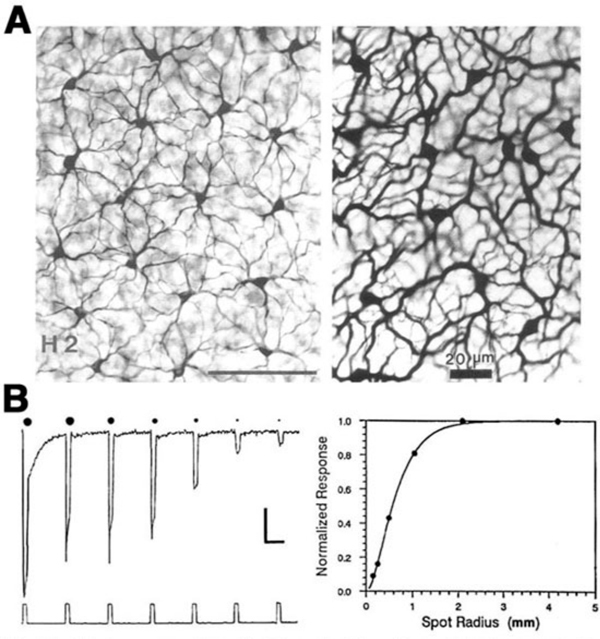 The dendrites of B-type horizontal cells in mammalian retinas are bushy and contact all cones within the dendritic field. The axon emerges from one of these dendrites. At its distal end, an axon terminal sprouts to collect signals from large numbers of rods at some distance from the cone-contacting dendritic field. The length and thinness of the axon is believed to electrically isolate one portion of the cell from the other, thereby, separating a cone-photoreceptor-involved compartment of the cell from a rod-photoreceptor-involved compartment (17). In species where there are few rods (Fig. 2a, turtle) the B-type axon terminal makes sparse contacts with both red cones and the few rods present in this retina (36, 52). Nonetheless soma-dendritic and axon terminal compartments maintain physiological separation, as evidenced by different summation areas (53). The type I horizontal cell of pigeon retina is axon bearing and also appears analogous to mammalian B-type cells. Similar to turtle, the axon terminal contacts a mixture of rods and cones, while the dendrites contact cones (35). A-type horizontal cells in mammals are purely cone connecting (most species have only green and blue cones). They have no connections with rod photoreceptors at all. The H2 cell of the trichromatic primate retina (humans and old world monkeys) is a kind of A-type cell. Even the H2 cell, where one or more dendrites are elongated and axon-like, contacts only cones. Interestingly enough, these longer dendrites contact principally blue cones. This may be a general theme for mammalian axonless horizontal cells that is only now being realized. In certain big cats (not yet confirmed in domestic cat), the elongated dendritic tips of A-type cells contact blue cones, while the dendrites closer to the cell body are in contact with both red cones and blue cones (54). In horses the A-type cell is apparently only connected to blue cones (Fig. 2a) (38, 40). In reptiles, and birds with well developed color vision, typically there are two axonless horizontal cell types. Each of these connects selectively with a cone type. In turtles, birds, and fish, species with excellent color vision, type H2 and type H3 horizontal cells are large, stellate cells. In birds and turtles these cells lack axons, but in fish H2 and H3 are axon-bearing. 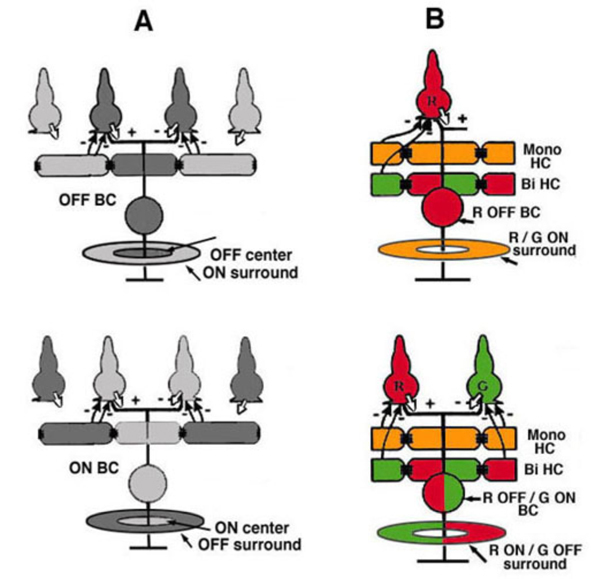 These cells contact cones selectively and sense color (Fig. 2a, axonless, color-opponent types of birds and reptiles; Fig. 2b, H2 and H3 axon bearing types of fish). H2 and H3 respond to some wavelengths with hyperpolarization, and to other wavelengths with depolarization. Thus, in turtle (pentachromats) and fish (trichromats or tetrachromats), H2 horizontal cells connect to green and blue cones and H3 to blue cones (Fig. 2a, Fig. 2b), or to blue cones and ultraviolet cones (6, 7, 36, 37, 41, 43, 52, 55, 56). 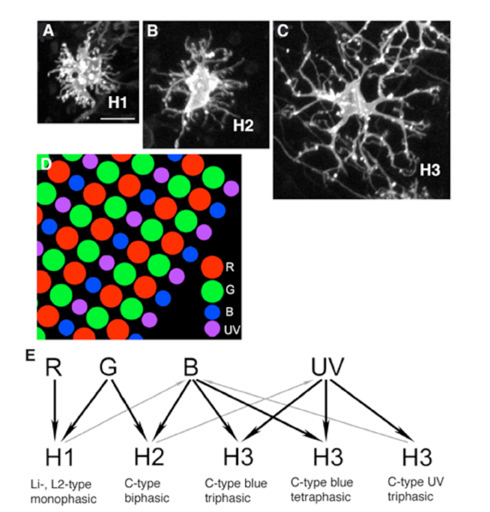 In the turtle and zebrafish, ultraviolet-sensitive cones appear to connect only with H3 type horizontal cells, sharing this type with blue cones. Some chromatic horizontal cells can be recognized in immunohistochemistry. The C-type horizontal cells of the turtle can be labeled with antibodies to nitric oxide synthase and calcium binding proteins (47); the former suggests a role for NO in their functioning (see section on Neuromodulation). Horizontal cells always interact with photoreceptor terminals at what are known as ‘lateral elements’ post-synaptic to photoreceptor ribbons (Fig. 3a, le, arrow). In fish retinas, the horizontal cell connections with cones at the lateral elements are characterized by minute projections called spinules (Fig. 3b). Spinules are dynamic and change shape with the level of illumination. Spinule formation is stimulated by background illumination, while darkness causes retraction (57, 58). These plastic spinules are known to contain the calcium binding proteins caldendrin and CaMKII (59). Spinules are under an endogenous circadian control but need centrifugal control from the brain via FMR-amide-like and GnRH-like hormone releasing hormones (60, 61) acting upon the dopaminergic interplexiform cell system in the retina (62, 63). These spinules appear also to be under the local control of the visual-cycle byproduct retinoic acid (64, 65). Figure 3. a) Electron micrograph of cat outer plexiform layer (OPL) shows an A-type horizontal cell dendritic terminal entering an overlying cone pedicle to form a lateral element (le) at a ribbon triad. b) Light adapted fish retina exhibits spinules (spin) on horizontal cell lateral elements in cone pedicles at synaptic ribbon (sr) synapses. c) High magnification electron micrograph of a gap junction between two A-type horizontal cell dendrites in the cat retina. 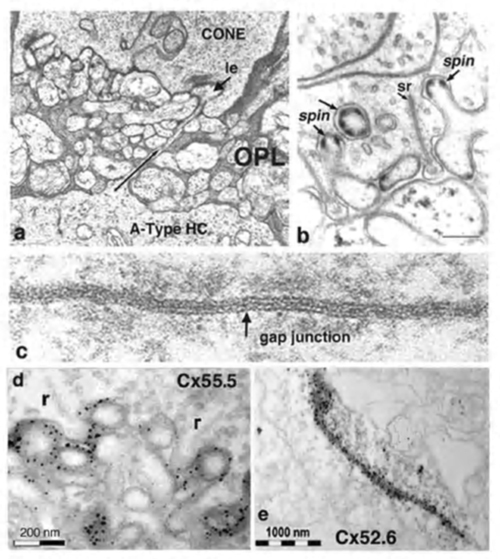 The latest information concerning gap junction connexins in zebrafish retina shows that d) Cx 55.5 forms a hemi- gap junction between HC dendrites and cone pedicles at the ribbon synapse (arrow), while e) complete gap junctions between HC dendrites are made by Cx 52.6. The illustrations in a and c are from Kolb (1977) (103). The illustration in b is from From DeJuan and Garcia, (2001) (62). Both d and e are taken from Shields et al., (2007) (72) . Retinal horizontal cells in all species are interconnected to homologous neighbors, by areas of gap junctions. These occur between dendrites, between axon terminals, and occasionally between dendrites and cell bodies. Gap junctions are very selective, occurring only between cells of the same type (that is H1 to H1 etc). This exclusivity even extends to axon terminal regions and dendritic regions of B-type horizontal cells, that is, gap junctions connect dendrite to dendrite, and axon terminal to axon terminal, but not axon terminal to dendrite (66, 67). The gap junctions can be extremely large, appearing as plaques (Fig. 3c). First described in fish retinas by Yamada and Ishikawa (28), gap junctions were considered “fused membrane structures” specialized for electrical transmission. Procion Yellow dye diffusion between morphologically similar horizontal cells was noted by Kaneko (66) and indicated that the electrical junctions could pass small molecules freely through the so-called S-space of horizontal cells (10). Gap junctions are formed at closely opposed plasma membranes (2-4 nm gap) from two horizontal cell processes (Fig. 3c). Each of the interacting cells supplies connexons or hemichannels to complete the gap junction contact. These channels can consist of homomeric or heteromeric connexin subunits, thus, potentially allowing a huge variety of gap junctions with slightly different properties to exist between various neurons. Each connexon channel contains six connexins (Cx) surrounding the channel pore. In fish and turtle retinas Cx43 and Cx26 were originally thought to comprise the horizontal cell gap junction connexins (68, 69). However more recently connexin 57 has been demonstrated to be expressed at the protein level and to mediate dendritic gap junctions between mouse B-type horizontal cells. The number of junctions appears to increase with light adaptation (70). In a study on rabbit retina where, unlike mouse, both A- and B-type horizontal cells occur, O’Brien and colleagues have found that Cx50 is the connexin between A-type horizontal-cell dendrites (71). In zebrafish multiple connexins are expressed, in particular Cx52.6 that participates in dendro-dendritic junctions (Fig. 3e) and Cx55.5 that forms hemi-gap-junction channels with cones at lateral elements (Fig. 3d) (72). In zebrafish with Cx55.5 knockout, horizontal-cell color opponency is reduced (73). This connexin is important for feedback modulation of cone synapses. In addition to Cx55.5, another connexin (52.9) is also expressed in zebrafish horizontal cells. It is found both in lateral elements where it may participate in feedback, and in gap junctions between horizontal cell dendrites within the outer plexiform layer (73). Horizontal cell gap junctions pass not only ions but small cytoplasmic molecules and tracer dyes of less than 500 Dalton size (74). Gap junctions enlarge horizontal cell receptive fields (see section on gap junction physiology), and are modulated by retinal neurotransmitters or humoral factors (see section on neuromodulation). The vertebrate retina contains a mosaic of rod- and cone-photoreceptors that serve for dark- and light-adapted vision respectively. Multiple cone types, each selectively expressing a visual pigment tuned to a specific region of the visible spectrum, provide vertebrates with the opportunity to discriminate colors. Cone types are defined by the spectral preference of their visual pigment; e.g. short-wavelength (SW) cones, medium-wavelength (MW) cones and long-wavelength (LW) cones, also referred to as blue/UV cones, green cones and red cones respectively. Most mammals are dichromats (2 cone types); however, old world monkeys and humans are trichromats (3 different cone types), and many non-mammalian species are also trichromats or even tetrachromats (4 different cone types). In the retinas of birds, fish and reptiles, a class of SW cones that are sensitive to ultraviolet light (UV cones) can be found (27, 75-79), in addition to the LW, MW, and typical SW cones (red, green and blue cones respectively). Since rods and cones of different spectral types are directly connected to horizontal cells, it is of interest to explore how horizontal cells integrate and process this richness of spectral information. Physiologists recognize two major types of horizontal cell, luminosity and chromaticity. These can be distinguished by photoresponses to lights of different wavelength. The luminosity (L-type) horizontal cells always respond with hyperpolarization to light stimuli of any wavelength within the visible range of the spectrum, while the chromaticity (C-type) horizontal cells respond with different polarity to light stimuli of different wavelengths (80). Luminosity (L-type) horizontal cells are found in every retina that has been studied, non-mammalian vertebrates, mammals and primates. Figure 4 shows the photoresponses of luminosity-type horizontal cells from toad (A), rabbit (B) and monkey (C) retinas. Regardless of the wavelength, these cells respond with membrane hyperpolarization that depends only on the brightness and duration of the stimulus. In some species, two classes of L-type horizontal cells can be distinguished both by anatomical structure and physiological properties. In the turtle retina, the L1 and L2 types are similar in spectral sensitivity but differ in receptive field size and in photoresponse kinetics to red and green light (53, 81). Anatomically, these two L-type horizontal cell physiologies are respectively the axon terminal and the soma of the turtle H1 horizontal cell (Fig. 2a). Figure 4. 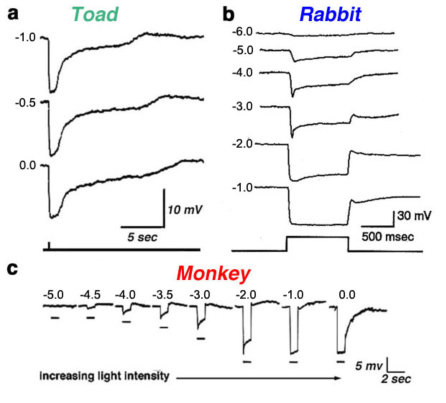 Photoresponses recorded from luminosity-type horizontal cells of toad, rabbit and monkey retinas. In each case, photoresponses were elicited by light stimuli of different intensities. Stimulus intensity is given in log units relative to the most intense stimulus available for the particular recording system. The illustration in a is from Normann and Pochobradsky, 1976 (295); in b from Bloomfield, 1992 (296), and in c from Dacheux and Raviola, 1990 (23). In cat and rabbit retinas, A-type and B-type cells (Fig. 2a) are both luminosity types. They differ in morphology and in connectivity with rods and cones but respond only with hyperpolarizations to light stimuli (14, 15, 17). Differences in A- and B-type spectral properties have not yet been reported. Like turtle retinas, the retinas of cyprinids and old world monkeys have both red and green cones. In these species some L-type horizontal cells favor green cone signals, while others favor red cone signals. In cyprinids, the former is called an L1 type, and the latter an L2 type (82). In old world primates both red and green favoring L-type signals arise from the H1 morphological type. Rather than two discrete types, there is a distribution in the balance of red cone and green cone signals for H1 cells (21, 24). In zebrafish also, there is a distribution in red-green balance on the H1 cell, yielding at the extremes L1 green-peaking types, and L2 red-peaking types (6). Figure 5. Color opponency of S-potentials in the fish retina. a. Responses were recorded as a function of wavelength covering the entire visible spectrum using light stimuli of different wavelength but similar quantal content. b. The responses that were elicited by selected light stimuli, numbered in a from -4 to +4, are shown at greater time resolution. The longer time marks on the rectangular stimulus traces (upper traces in b) are 100 msec, the shorter, 10 msec. The illustration is from Svaetichin and MacNichol, 1959 (80). Figure 6. Wavelength dependency of the photoresponses from an L-type horizontal cell, a red/green C-type horizontal cell, and a yellow/blue C-type horizontal cell in the retina of the turtle Mauremys caspica. For each wavelength, several intensities are nested. The illustration is from Twig et al., 2003 (92). In 1959, Svaetichin and MacNichol (80) first reported on extreme wavelength-dependency of some S-potentials (Fig. 5). As shown in the figure, the photoresponses of this S-unit reversed in polarity at a wavelength of about 560 nm. Photoresponses to light stimuli of longer wavelength depolarized the cell membrane, while stimuli of shorter wavelengths hyperpolarized the cell membrane. Svaetichin and MacNichol called these ‘color opponent’ S-units chromaticity or C-type horizontal cells. C-type horizontal cells have been extensively studied in turtle, amphibian and fish retinas (7, 9, 55, 83-94). Horizontal cells are named by the number of wavelengths at which response polarity reverses; no reversal – monophasic (or L-type) cells, one reversal – biphasic C-type cells, two reversals – triphasic C-type cells, three reversals – tetraphasic C-type cells. Wavelengths at which response polarity reverses are called ‘null wavelengths’. In fish retinas, three types of chromaticity horizontal cells have been described; biphasic, triphasic and tetraphasic (6, 86, 95, 96). In the bowfin retina, the null wavelength for the biphasic cells is around 640 nm, while null wavelengths of the triphasic cells are; in the regions of 500-530 nm and 650-670 nm respectively (95). The biphasic and triphasic C-type horizontal cells of the fish retina are identified morphologically as H2 and H3 types respectively (Fig. 2b). In zebrafish the H3 morphological type has taken on as many as 3 physiological identities: the blue triphasic, analogous to previous findings in fish, a UV triphasic type, and a tetraphasic type (6). In the turtle retina, two classes of biphasic C-type horizontal cells have been identified (7, 85, 91). Typical photoresponses of L-type and C-type horizontal cells in the turtle Mauremys caspica to light stimuli of different wavelength and intensity are shown in figure 6. For each wavelength, a series of photoresponses to different intensities is shown. The L-type horizontal cell (1st row in Fig. 6) responds to all stimuli with graded hyperpolarizations regardless of wavelength. 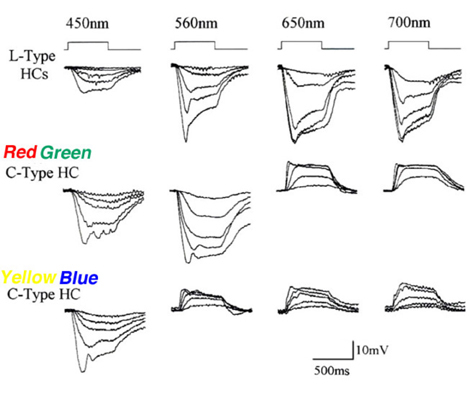 The red/green biphasic C-type horizontal cell (2nd row, Fig 6) responds with graded depolarizations to red light stimuli and with graded hyperpolarizations to yellow, green and blue stimuli. The yellow/blue biphasic horizontal cell (3rd row, Fig. 6), responds with depolarizations to red and yellow light stimuli and with hyperpolarizations to blue light stimuli. In order to define the spectral properties of the horizontal cells, monochromatic light stimuli of dim intensities are used to elicit small amplitude (<1mV) photoresponses. These photoresponses are within the linear range of the cells and can be used to calculate light sensitivities. Sensitivity is defined as the volts of evoked response per quantum of light and is calculated by dividing the voltage response by the number of quanta in the stimulus. The relationship between light sensitivity and wavelength is the action spectrum of the cell and describes the threshold spectral properties. 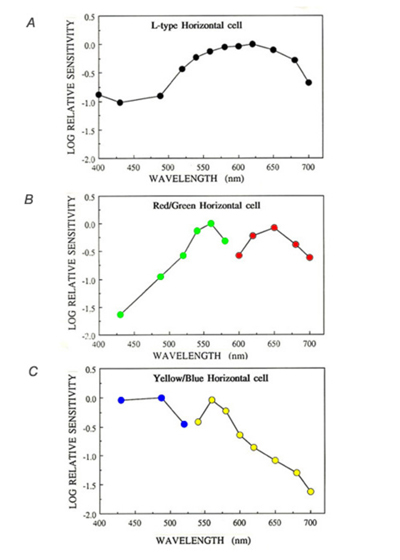 Figure 7 shows the mean action spectra of 8 L-types, 7 red/green types and 6 yellow/blue types of horizontal cell (A, B and C respectively) from the turtle Mauremys caspica. These spectra clearly demonstrate that the L-type horizontal cells are most sensitive to long-wavelength stimuli, with the major excitatory input coming from red cones (7, 85). These cells receive additional excitatory input from green cones and to a lesser extent from blue cones (85). The red/green C-type horizontal cells are characterized by reversal of response polarity around 600 nm (Fig. 7B). These cells are excited by green and blue cones and inhibited by red cones (7, 85). The yellow/blue C-type horizontal cells are inhibited by green and red cones and excited by blue cones (7, 85) and interestingly, also by UV cones (27, 97). Their photoresponses reverse in polarity around 540 nm (Fig. 7C). Figure 7. Action spectra of 8 L-type (A), 7 red/green C-type (B) and 6 yellow/blue C-type (C) horizontal cells in the turtle retina (Mauremys caspica). Sensitivity data were calculated from photoresponses of small amplitude (<1 mV) that were elicited by dim light stimuli illuminating the entire receptive field of the studied cells. In order to compare the different action spectra, the spectrum of each cell was normalized to the peak sensitivity. In (A), all responses were of hyperpolarizing polarity. In (B) and (C), depolarizing responses are marked respectively by red and yellow circles, and hyperpolarizing responses by green and blue circles. Reproduced from Asi and Perlman, 1998 (85). Triphasic color responses are only rarely reported in turtle horizontal cells (94), but they are common to some cyprinid retinas, where even tetraphasic responses occur (6, 86, 95, 96). The processing of spectral information at just this first post-photoreceptor synapse in these species is quite amazing. Six spectral configurations occur in zebrafish retina (6). The most elaborate of these is the tetraphasic response, with three null points across the spectrum. It is depolarized by UV light, hyperpolarized by blue, depolarized by blue-green, and hyperpolarized by yellow and red (Fig. 8A). Spectral analysis shows that tetraphasic types are depolarized by both green and UV cones, and hyperpolarized by red and blue cones (6). Like other fish (95), zebrafish has triphasic responses, but there are two types, one hyperpolarized primarily by UV cones (Fig. 8B) and the other hyperpolarized primarily by blue cones (Fig. 8C). Both these triphasic cells depolarize with middle-wavelength (green cone) stimulation, and hyperpolarize with long-wavelength (red cone) stimulation. The biphasic cells of zebrafish (Fig. 8D) are depolarized by long wavelengths (red cones) and hyperpolarized by short and medium wavelengths (both blue and green cones) (6). The zebrafish L-type horizontal cells (Fig. 8E, 8F) are hyperpolarized by input from both red and green cones, but are little influenced by blue cone and UV cone signals. 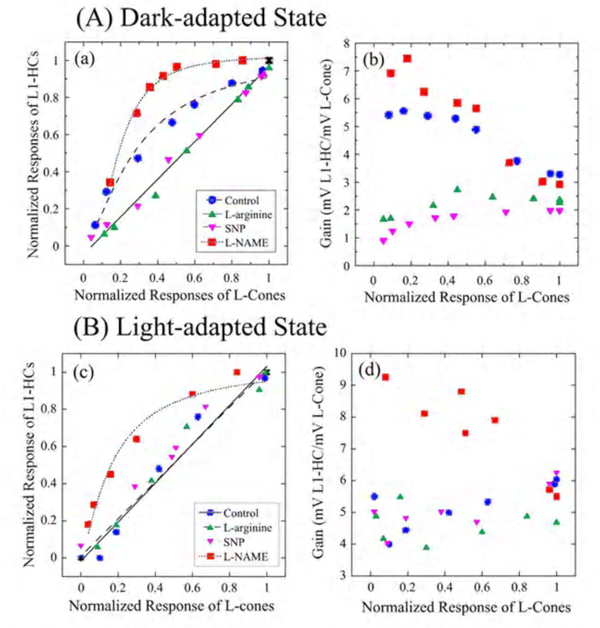 When response amplitudes at different wavelengths are fit by a spectral model that takes into account the shapes of zebrafish cone pigments (6, 98), L-type responses to blue and UV stimuli (Figs. 8E, 8F) are shown to result from stimulation of the short-wavelength absorbance limbs of red and green cones. L1 types show a balance of red and green cone signals and L2 cells hyperpolarize predominantly in response to red cone stimulation (6). Figure 8. Color physiology of zebrafish horizontal cells. A. Tetraphasic type is depolarized by ultraviolet (UV-330nm) hyperpolarized by blue (410nm) depolarized by blue-green (490nm) and hyperpolarized both by yellow (570nm) and red (650nm) wavelengths. 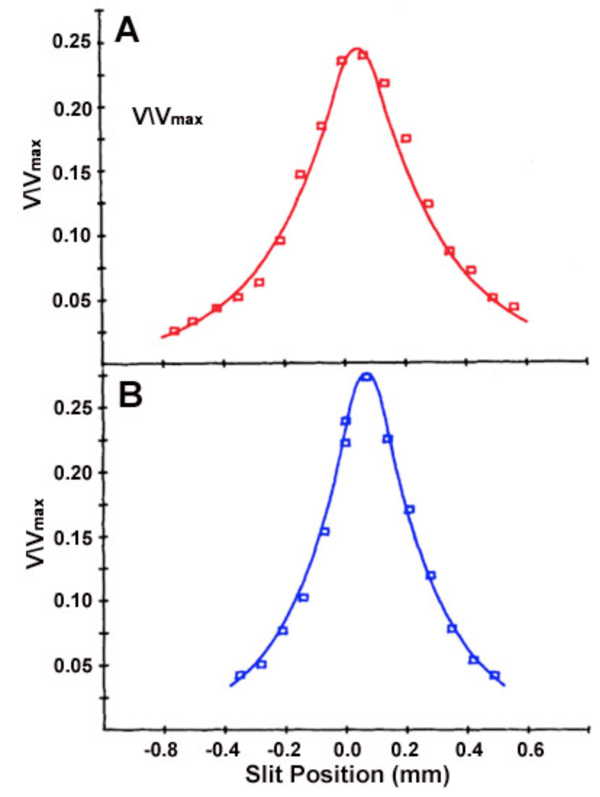 B. UV triphasic cell hyperpolarizes at full amplitude for both irradiances of the UV 330nm stimuli but is depolarized by the dimmer of the blue 410nm stimuli and hyperpolarized by the brighter 410nm stimulus. For 490nm the cell depolarizes, but at longer wavelengths the cell hyperpolarizes. The blue triphasic cell (C) hyperpolarizes fully for both 410nm blue stimuli, but responds only weakly to 330nm UV stimuli. Depolarization occurs in the blue-green (490nm) and yellow (570nm) but the cell hyperpolarizes for red stimuli (650nm). The biphasic cell (D) is hyperpolarized for short-wavelengths (330nm, 410nm, and 490nm) but is depolarized by long wavelengths (570nm, 650nm). Two L-type cells, L1 (E) and L2 (F) hyperpolarize at all wavelengths, but the amplitude ratio at 490nm and 570nm favors 570nm for the L2-type, and is more evenly balanced for the L1-type. All amplitudes are given in mV. Numbers to the right of each trace are stimulus irradiance, given in log(hν∙μm-2·s-1). Illustrations are from Connaughton and Nelson, 2010 (6). Given the diversity of horizontal-cell physiology in lower vertebrates, where dendritic contacts with cones containing different visual pigments frequently produce chromatically opponent responses, it is surprising that in mammalian retinas, whose horizontal-cell dendrites also contact cones with different visual pigments, only luminosity-type horizontal cell responses can be recorded (18, 19, 22, 99, 100). For example, both cat A- and B- horizontal cells are luminosity types (Fig. 9), that are dominated by red-cone input, although low-level synergistic input from blue cones can be detected using specific spectral stimulating and adapting conditions (100). In both A- and B- type cells, rod signals (Fig. 9) are intermixed with cone signals (16, 17). Figure. 9. Rod-cone mixing in horizontal cells of the cat retina. Responses to light stimuli of different intensities were recorded from the cell bodies of A-type and B-type horizontal cells and from the axon terminal of the B-type horizontal cell. Brighter stimuli produce greater amplitudes from the cones, and longer ‘rod after-effects’ from the saturated rod signals. The illustration is adapted from Nelson et al., 1975 (17). The failure of mammalian horizontal cells to be color opponent may correlate with the absence of a horizontal cell that avoids contact with long-wavelength cones. The biphasic responses in zebrafish retinas are thought to arise from an H2 type horizontal cell that avoids contact with red cones, while selectively contacting green, blue, and UV cones. Excitatory input arises from the blue and green cone contacts, and the red inhibitory input arises from feedback contacts from red-cone dominated H1, L-type horizontal cells, onto blue cones (Fig.2b, panel E). In the H2 cell there is no red hyperpolarizing signal to mask the H1 red-inhibitory feedback onto the blue cones. This allows the H2 cell to show the color opponent feedback signal (37). In primate retina, despite a full complement of red, green and blue cone types, horizontal cells also only occur as luminosity types (22, 23). H1 cells receive synergistic signals from long- and medium-wavelength cones (red and green cones), while H2 cells receive synergistic input from all three spectral types of cones; long- medium- and short-wavelength (red, green and blue cones) as shown in figure 10. Anatomically H1 type horizontal cells tend to avoid the pedicles of blue cones (Fig. 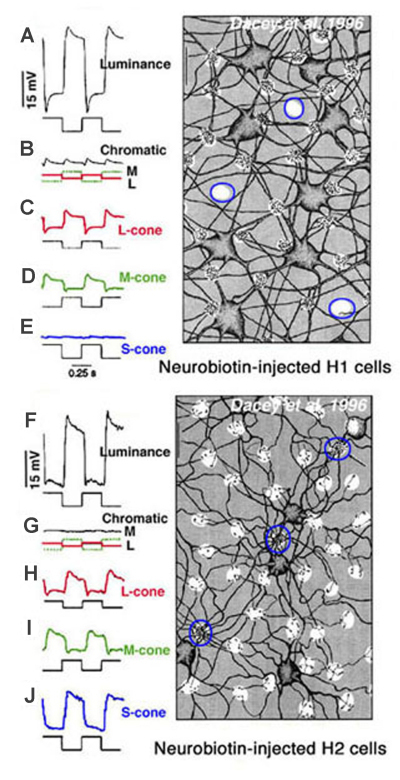 10, Neurobiotin-injected H1 cell) (22, 101) and are therefore not responsive to blue-cone isolating stimuli (Fig. 10E). On the other hand, large numbers of H2 dendrites contact blue cone pedicles (Fig. 10, Neurobiotin-injected H2 cells, outlined clusters) (22, 101, 102). The H2 cell is indeed very sensitive to the blue end of the spectrum (Fig. 10J). Yet, the responses of both horizontal cell types are only of hyperpolarizing polarity to all wavelengths (22). Thus, it appears that subsets of mammalian and primate L-type horizontal cells are devoted primarily to processing of either red green and blue signals or red and green signals, but spectral opponency is not part of the processing regime. Figure 10. Connectivity and physiology of horizontal cells in the monkey retina. Above: Intracellular staining and chromatic responses of H1 cells. These cells avoid dendritic contact with S-cones (blue outlined white circles). There is no response to S-cone (blue-cone) isolating stimuli (trace E). Below: Intracellular staining and chromatic responses of H2 cells. These cells send many dendrites to S-cones (blue outlined cones) as well as to red and green cones. The response to S-cone isolating stimuli is large (J). The illustration is from Dacey, 1996 (22). 5. Rod and cone contributions and passive electrical models. 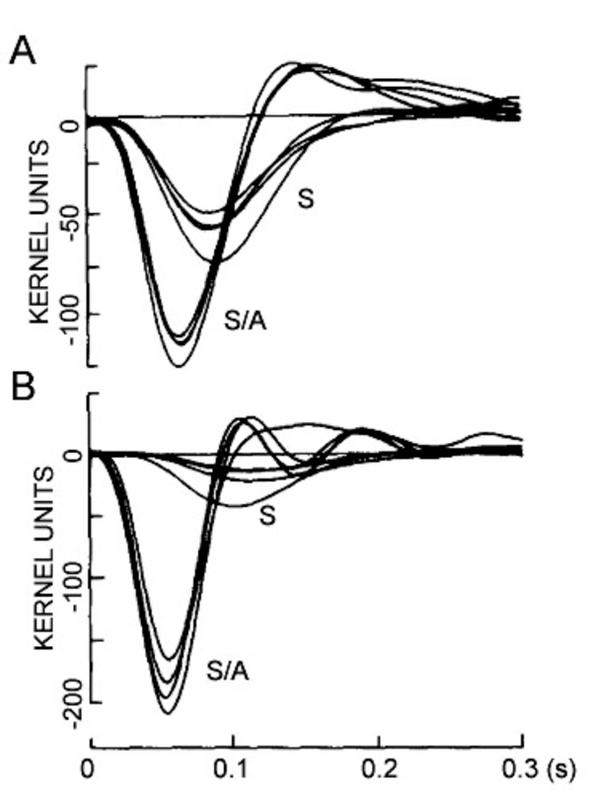 Steinberg (19, 99) was the first to distinguish separate rod and cone signals in S-potentials from a mammalian retina. He made intracellular recordings from horizontal cells in the cat retina and saw the typical graded hyperpolarizing responses that depended upon the intensity of the light stimulus. However, unlike the responses seen in non-mammalian retinas, Steinberg’s S-potential recordings revealed much more distinct rod and cone contributions to the response. A very slow phase of membrane repolarization seen after termination of the light stimulus was identified as the rod contribution. Steinberg called this the ‘rod after effect’ (Fig. 9). The difference in offset kinetics for rod and cone signal components provides a convenient assay for separating rod and cone inputs to S-potentials in rod-dominated mammalian retinas (16). In Figure 9, typical mixed rod and cone signals of all three horizontal cell structures in cats are shown (17). In A- and B-type horizontal cell bodies, rod and cone signals are about equal in amplitude, whereas in the axon terminal of the B-type cell, the slowly recovering response characteristic of rod signals occurs. This is interpreted to indicate that rod and cone signals are almost equally mixed in cat horizontal cell bodies, but only rod signals are seen in the axon terminals. The ‘rod after effect’ grows increasingly prolonged with bright light stimuli (Fig. 9, bottom). Further evidence for the mixing of rod and cone inputs to cat horizontal cells is seen during light adaptation. When retinas are light adapted by steady background lights, rod signals saturate and rod contributions to the horizontal cell photoresponses, including rod after-effects, vanish. In contrast, the cones adapt to the brighter conditions and their input remains robust. These properties of rod and cone inputs are easily seen in the photoresponses of mammalian horizontal cells such as cats and rabbits (15, 17, 19). The photoresponses of the rod-dominated B-type horizontal cell axon terminals are virtually abolished by light adaptation. In the horizontal cell bodies (A and B types), which receive mixed rod and cone inputs, light adaptation selectively reduces the rod contribution but large cone signals remain and therefore, these horizontal cell elements continue to respond well in the presence of background lights (16). Axon terminals of the axon-bearing B-type horizontal cells in the cat receive an excitatory feed-forward input only from rods, but the cell bodies of A-type and B-type cells contact only cones. So where does the large rod component of the S-potential in the cell bodies of cat horizontal cell bodies come from? Electron microscope observations show gap junctions linking rod and cone photoreceptors in the mammalian outer plexiform layer (103, 104). These electrical synapses introduce rod signals into cones and thence into horizontal cells. This rod/cone mixing in the photoreceptors is now considered one of the pathways whereby rod driven inputs pass to horizontal cells and to all subsequent second and third order cells in the retina (105-108). In other species, similar characteristics of rod-cone mixing can be found in horizontal cells. 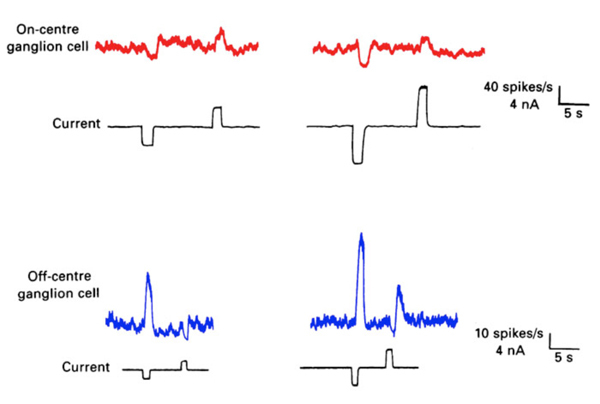 In the rabbit retina, as in the cat retina, rod-dominated input to the axon terminal is identified by waveform, sensitivity and the presence of after-potentials (15, 109). Also in primate retina, the axon terminals of the axon-bearing H1-type horizontal cells produce rod signals while the cell bodies produce cone or mixed rod-cone signals (22, 23, 26). Similar to other mammalian retinas, the somata of primate H1-type horizontal cells receive rod input indirectly via gap junctions between rods and cones (26). Horizontal cells of reptiles and amphibians, like mammals, mix rod and cone signals. In the retina of the turtle Chelydra serpentina, the photoresponses of H1 axon terminals contain slow, low-amplitude components that are contributed by rod photoreceptors, despite the major excitatory input being from long-wavelength sensitive cones. The cell bodies of the same H1 horizontal cells receive input only from long- and medium-wavelength sensitive cones (110). In Xenopus, horizontal cell dendrites contact both rods and cones (111). Similar to mammals, waveforms characteristic of rods and cones, including rod after-effects are recorded in these cells with light stimulation (112). The amphibian circuitry, with direct rod contacts onto horizontal cell dendrites, differs from mammals, where only cones are contacted, and rod signals enter cones directly through gap junctions. No rod signals have been reported in the purely cone-contacting horizontal cells of fish (Fig. 2b, Fig. 8). In fish rod signals are restricted to H4, a special rod-connected horizontal cell type (45, 46). All vertebrate retinas contain at least one horizontal cell type that is an axon-bearing cell (Fig. 2a, B-types). The axon terminals and somata of these horizontal cell types are connected by a long thin axon, but in many cases each end behaves as an isolated physiological unit. In the turtle Pseudemys scripta elegans, both axon terminals and somata receive excitatory input mainly from red cones but differ in spatial properties and response kinetics for red and green stimuli (53, 81). In another turtle species, Chelydra serpentina, the axon terminal receives excitatory input from red cones and rods while the cell body dendrites contact red and green cones (110). In domestic mammals (cat, rabbit) and in primates (monkey), the dendrites of the cell body receive input from cones while the terminals of the axon contact thousands of rods. No evidence has been found to indicate any synaptic or electrical interaction between the axon terminal and the soma of the same cell in any of these cases. Where horizontal cell types have the dendritic portion of the cell much distant from the axonal ending (Fig. 2a, B-types), calculations based on the anatomical dimensions and geometry of the neuron, and ohmic linear properties of cell membrane and cytoplasm, indicate that the axons are too long and thin to allow significant passive electrotonic spread of signals from one end of the cell to the other (17, 26, 36, 110). Such models tell us that signals in cell bodies and axon terminals of horizontal cells reflect only the local synaptic inputs. Indeed, the two portions of the same cell act as independent units (17), in clear violation of neuron theory. The exception to this rule of physiological separation between cell body and axon terminal appears to be the cone-connected horizontal cells in fish. The cone responses of axon terminals in these cells are similar to the cell bodies (3). As there are no cone contacts from/to the axon terminals in fish, it appears likely that signals are passively conducted from the cell body. The high impedance of the simple unbranched axon terminal may be permissive to the passive propagation of signals through the axon. Photoreceptors excite horizontal cells through sign-conserving synapses. In darkness, photoreceptors continuously release an excitatory neurotransmitter that opens horizontal-cell cationic channels with a depolarized reversal potential. Therefore, the horizontal cells are maintained at a relatively depolarized potential in darkness. When the photoreceptors are hyperpolarized by a light stimulus, neurotransmitter release is reduced, the post-synaptic ligand-gated channels close and the horizontal cells hyperpolarize. Neurotransmitter release from photoreceptor terminals is calcium dependent. Exposing the retina to ions that interfere with calcium influx through voltage-dependent calcium channels blocks neurotransmitter release from the photoreceptors, and consequently horizontal cells hyperpolarize (113-115). Early experiments in intact retinas pointed to the excitatory amino acids L-glutamate and L-aspartate as putative candidates for the photoreceptor neurotransmitter (116-120). 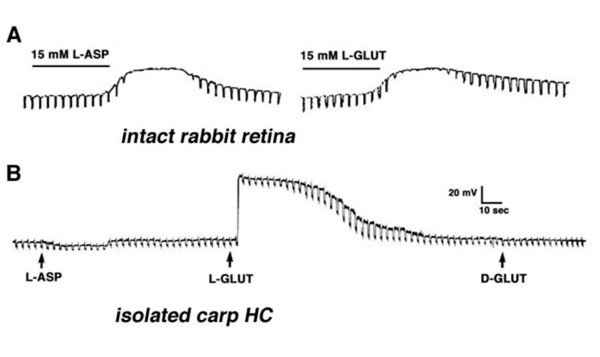 Exposing the retina to either L-glutamate or L-aspartate caused depolarization of horizontal cells and loss of photoresponses as shown in figure 11A for horizontal cells in the intact rabbit retina (116). These observations are consistent with the notions that an excitatory amino acid is continuously released by the photoreceptors in the dark, and that light-induced hyperpolarization of horizontal cells reflects the reuptake of the amino acid from the synaptic cleft. Accordingly, exogenously applied neurotransmitter saturates the receptor sites in the horizontal cells causing further depolarization. Since the horizontal cells are saturated with the exogenously applied neurotransmitter, modulation of endogenous transmitter release by light stimuli has little effect on membrane potential and the photoresponses are eliminated. In the experiment described in figure 11A, solutions containing 15 mM L-aspartate or L-glutamate were needed to induce depolarization of rabbit horizontal cells and loss of photoresponses. These and other studies raised two major questions. (1) Why were relatively high concentrations (in the millimolar range) of excitatory amino acids needed to exert the effects shown in figure 11A? (2) Which of the two excitatory amino acids was the photoreceptor neurotransmitter? Figure 11. A. L-aspartate and L-glutamate depolarize horizontal cell membrane potential and abolish horizontal cell photoresponses in intact rabbit retina. These photoresponses were elicited by diffuse light stimuli. The illustration is from Bloomfield and Dowling, 1985 (116). B. L-glutamate depolarizes the membrane potential of a horizontal cell isolated from the carp retina, while L-aspartate and D-glutamate exert no effect. Each application pipette was filled with 500 µM of drug. Current pulses measure changes in membrane resistance. The illustration is from Lasater and Dowling, 1982 (125). The first question was answered by the identification of efficient uptake systems for glutamate and aspartate by excitatory amino acid transporters (EAATs) (121, 122). EAATs efficiently remove excitatory amino acids from extracellular space, thereby greatly reducing the concentration of the exogenously applied aspartate or glutamate reaching the cone-to-horizontal-cell synapses. Retinal glutamate transporters are reviewed elsewhere in Webvision. When non-transportable analogues of excitatory amino acids are applied, considerably lower concentrations are needed to exert effects on horizontal cells (109, 123). This is illustrated in figure 12 where the effect of 10 mM L-glutamate (A) is compared to that of 0.1 mM kainic acid (B). Kainic acid, an agonist for AMPA-kainate-type glutamate receptors in vertebrate horizontal cells, but not a substrate for EAATs, exerts effects similar to L-glutamate at a concentration lower by 100 fold. In both cases horizontal cells are depolarized and photoresponses lost. In further support of the excitatory amino acid receptor hypothesis, kynurenic acid, a non-selective antagonist of excitatory amino acid receptors (124) hyperpolarizes horizontal cells, also with loss of photoresponse (Fig, 12 C). Figure 12. The effects of L-glutamate (a), kainic acid (b) and kynurenic acid (c) upon the membrane potential and photoresponses of L-type horizontal cells in the retina of the turtle Mauremys caspica. The illustrations are from Perlman. The exact identity of the excitatory amino acid was debated for more than a decade. A variety of experiments in intact retinas were designed to decide between L-glutamate and L-aspartate as candidates for photoreceptor neurotransmitter, but with conflicting conclusions. It was not until the development of the isolated cell preparation that a clear answer to this question was obtained. Lasater and Dowling (125), in their pioneering work, isolated horizontal cells from the carp retina and recorded the membrane potentials with sharp microelectrodes. Since these horizontal cells in culture were separated from all other influences of retinal circuitry, including photoreceptor stimulation, they were characterized by hyperpolarized resting potentials (close to the potassium equilibrium potential). 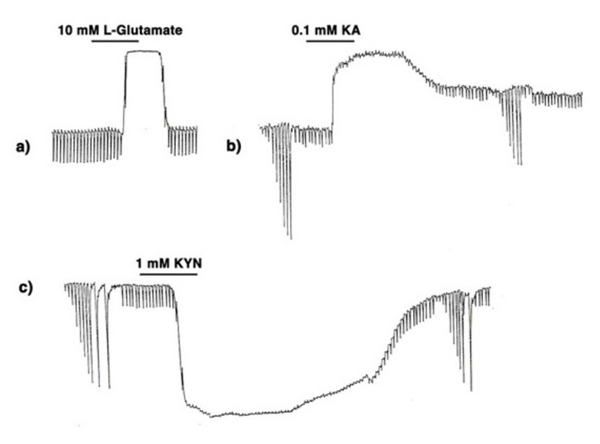 Application of low doses of L-glutamate, but not of L-aspartate or D-glutamate, induced depolarization, indicating that selective receptors for L-glutamate existed in the horizontal cell membrane (Fig. 11B). With this experimental approach, a low concentration of L-glutamate was sufficient to induce effects, because in this preparation, removal of extracellular L-glutamate by uptake systems is negligible. Voltage- and current-clamp techniques have been applied to isolated horizontal cells from a variety of species in order to reveal the properties of the glutamate-gated channels. These channels have a reversal potential around 0 mV, depending upon the composition of the intra-pipette and extracellular solutions (123, 126-128). Pharmacological analysis of the properties of the glutamate-gated channels in horizontal cells, using specific agonists and antagonists, revealed them to be of the AMPA/KA type. They are specifically activated by α-amino-3-hydroxy-5-methyl-4-isoxazole propionic acid (AMPA) or kainic acid (KA) and are antagonized by 6-cyano-7-nitroquinoxaline (CNQX) or cis-2, 3-piperidine-dicarboxylic acid (PDA) (129, 130). When AMPA/KA ion channels are activated by the agonist kainic acid, the induced currents are considerably larger than those elicited by L-glutamate, even at higher concentrations (127, 131). This effect has been attributed to fast desensitization of the AMPA/KA type channels by L-glutamate but not by kainic acid (132, 133). Selective blockers of the glutamate-induced desensitization (e.g. cyclothiazide) cause glutamate-induced currents to reach levels similar to those elicited by kainic acid, buttressing the conclusion that horizontal cells express largely AMPA-type glutamate receptors (134-136). Catfish horizontal cells, which express NMDA receptors in addition to AMPA/KA receptors, appear to be an exception to the above general conclusion (131). Further, there is physiological evidence for kainate receptors in addition to AMPA receptors in horizontal cells cultured from human retina (137). Glutamate also influences horizontal cells through metabotropic pathways. Unlike ionotropic AMPA-glutamate responses, metabotropic actions do not spread globally through membrane voltage changes within the horizontal cell network, but remain local, influencing only nearby cytoplasmic chemistry. DL-AP4, a glutamate analogue selective for type III metabotropic glutamate receptors, suppresses nearby voltage sensitive potassium channels (138). Similarly, group I and group III metabotropic glutamate receptors increase the amplitudes of nearby voltage-gated calcium currents in horizontal cells (139). Glutamate provides further metabotropic regulation of calcium and potassium channels through modulation of cytoplasmic pH (140). NMDA receptors on catfish horizontal cells have been observed to down-regulate voltage dependent sodium and calcium channel activity through a calmodulin-dependent mechanism, also a type of metabotropic effect (141). Furthermore sodium entry through stimulated AMPA-glutamate channels stimulates local activity of Na+K+ ATPase. This in turn appears important in setting membrane potential (142). Thus, in addition to causing the light response itself, photoreceptor glutamate regulates a variety of cellular and membrane functions. The photoresponses of horizontal cells from cold-blooded, as well as warm-blooded mammalian retinas, are shaped by voltage- and time-dependent ionic channels located within the plasma membrane (143-146). Five types of ionic currents; a sodium current, a calcium current and three types of potassium current have been identified in isolated horizontal cells of goldfish (147), catfish (148), white perch (143), skate (149), turtle (150), rabbit (145) and cat (146). Figure 13. Voltage- and time-dependent ionic conductances in isolated horizontal cells. A. Current responses to different voltage steps from a holding potential at -60mV in horizontal cells from the cat retina, from Ueda et al., 1992 (146). B. Current responses and I-V curves from 4 types of horizontal cells that were isolated from the retina of the white perch, from Lasater, 1986 (143). Voltage steps evoke membrane current responses for two types of horizontal cells isolated from the cat retina (Fig. 13A) and four types of horizontal cells isolated from the retina of the white perch (Fig. 13B). In cat horizontal cells, the inward sodium current is clearly evident during the first 10 ms of the current responses while at the steady state, a sustained outward potassium current is seen (Fig. 13A). Fish horizontal cells exhibit a more complex array of currents as evident from the current waveforms and the I-V curves for transient and sustained portions of the response to electrical stimulation (Fig. 13B). Basically all four types of fish horizontal cells exhibit similar ionic currents but they differ in relative magnitude. The sodium current is inward going and is seen during the initial 10ms of the current pulses that are recorded when the horizontal cells are depolarized from a negative holding potential (about -70mV) to around 0mV. It is very similar to the regenerative sodium current typical of spiking neurons. The physiological role of this current in horizontal cells is not known since these cells do not exhibit action potentials. Three types of potassium channel have been identified by their voltage- and time-dependency and by their sensitivity to specific blockers. The inwardly rectifying channels conduct an inward current when the cells are hyperpolarized below potassium equilibrium potential. In some species, extracellular sodium ions influence the reversal potential of these channels making the currents functional at physiological potentials (151). The sustained outward potassium current (delayed rectifier) is activated at potentials more depolarized than the resting, dark potential of the horizontal cells. The outward transient potassium current (IA), is activated upon fast depolarization from negative potentials. In the intact turtle retina, the outward transient potassium current is activated upon termination of a bright light stimulus, speeding the recovery of the L-type horizontal cell from the depolarizing overshoot at light offset back to the dark level. This effect allows the L-type horizontal cells to follow fast flickering stimuli and thus, improves the frequency response curve of the cells (152). L-type calcium responses are a prominent feature of isolated horizontal cells. These channels inactivate only slowly resulting in long duration spikes and persistent depolarized states (142, 146, 148, 153). Outward potassium currents appear in themselves too weak to inactivate calcium currents in these cells (154), however glutamate activation of the electrogenic Na/K ATPase appears sufficient to restore hyperpolarized membrane potentials (142). Calcium currents may sometimes contribute to oscillations in the light responses of horizontal cells (155). Some, but not all, horizontal-cell types accumulate GABA (51). A likely target of horizontal-cell GABA is other horizontal cells. Kamermans suggested GABA as mediator of positive feedback between these neurons (156). In many species GABAA and/or GABAC receptors are located on horizontal cells. Qian and Dowling discovered retinal GABAC receptors. They were localized on the membranes of isolated rod horizontal cells of white perch (157). Retinal GABAC receptors are reviewed elsewhere in Webvision. Currents from GABAA receptors are found in dissociated rabbit horizontal cells (158). Both GABAA and GABAC receptor currents as well as GABA transporter currents occur in isolated catfish horizontal cells (159, 160). Isolated horizontal cells from skate (161) or zebrafish (162) show no evidence of GABA receptor physiology, but do possess GABA transporter physiology. Horizontal-cell GABA circuits are species specific, nonetheless GABA would appear to be an important signaling molecule within the vertebrate outer plexiform layer, and GABA roles include signaling between horizontal cells. In all vertebrate retinas including mammals, horizontal cells are characterized by large-surface-area gap junctions (Fig. 3c) between each others’ dendrites (163, 164). These junctions allow lateral flow of small molecules and ions within the horizontal cell network. 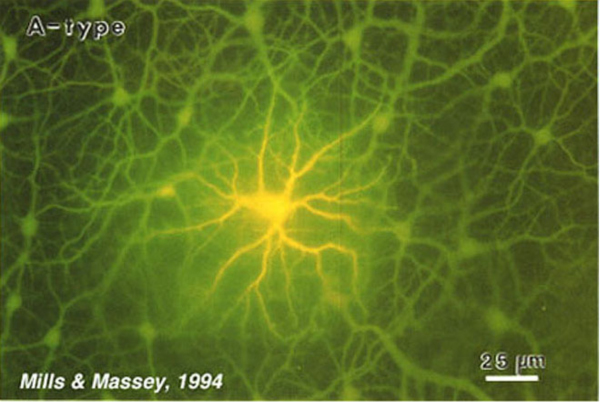 Gap-junction-permeant tracers such as Lucifer yellow or Neurobiotin that are injected into one horizontal cell in the layer spread to hundreds of neighboring cells, forming striking images of the interconnected horizontal cell network (Figs. 14, 15A) (14, 66, 67, 84, 165, 166). Gap junctions are formed only between neighboring horizontal cells of the same physiological type as shown in figures 14 and 15A. Networks of turtle H2 cells (Fig. 15A, left panel) and of rabbit A-type cells (Fig. 15A, right panel) are revealed by neurobiotin injection into one cell of the network. Gap-junction connexons between rabbit A-type horizontal cells accommodate molecules as large as 500 Daltons (74). The permeance of the gap junctions between horizontal cells and therefore, dye coupling, is influenced by the intracellular and extracellular milieu and by chemicals such as dopamine, retinoic acid, nitric oxide or hydrogen ions that are released by other retinal cells (see section on neuromodulators). Figure 14. Rabbit horizontal cell network revealed by dye injection. Lucifer dye, injected into one cell, spreads via the gap junctions linking A-Type horizontal cells to reveal the centrally injected cell and hundreds of neighboring cells. The illustration is from Mills and Massey, 1994 (67). The gap junctions between horizontal cells are highly permeable to small ions and therefore, serve as low-resistance pathways for electrical signals to spread laterally within the horizontal cell layer. Thus, horizontal cells receive excitatory input directly from photoreceptors via chemical synapses and also indirectly via gap junctions with neighboring horizontal cells. The physiological consequence of the gap junctions between horizontal cells is to create a very large receptive field that spreads out to distant retinal regions, regions beyond the extent of direct dendritic contact with photoreceptors (10, 66). The receptive fields of horizontal cells are measured by several spatial protocols. The most common are (1) examining responses to a series of concentric spots of increasing diameter but fixed irradiance, or (2) examining responses to long narrow slits of light presented at different positions across the retina. In either case response amplitudes can be modeled, at least to first order, by differential equations describing current flow in a resistive plane (16, 167, 168), or equivalently by discrete passive networks of interconnected resistors (53). An experiment in which an L-type horizontal cell in the retina of the turtle Pseudemys scripta elegans was stimulated with a series of concentric spots of fixed intensity is shown in figure 15B. The first photoresponse to the left was elicited with a stimulus of super-saturating intensity that illuminated the entire receptive field of the cell. This is the maximal photoresponse. A series of 6 photoresponses were then elicited by sub-saturating light stimuli with different stimulus diameters, as illustrated diagrammatically above each response. The photoresponse amplitude gradually decreases as the size of the illuminated retinal area is reduced (Fig. 15B; graph). This reduction of amplitude is not due to diminution of photoreceptor synaptic input to the recorded cell, as even the small spot stimuli are larger than the dendritic extent of the cell. Thus, it is suggested that the low amplitude of the responses to small spot light stimuli are due to shunting of the local photoreceptor input into neighboring horizontal cells through gap junctions. With full-field illumination, all the horizontal cells are evenly illuminated, equipotential, and therefore, no current flows between them. With small spot illumination, the membrane potential of non-illuminated horizontal cells is different from that of illuminated cells causing electrical currents to flow between them and thus, to shunt the responses of the illuminated cells. Figure 15. A. 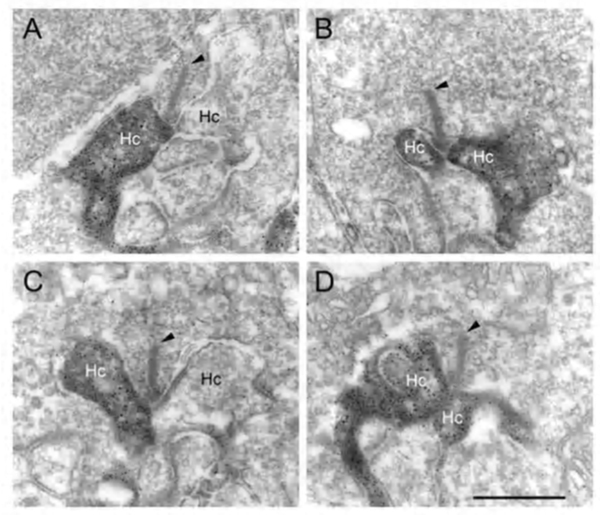 The syncytia of H2 cells in turtle retina (left) and A-type horizontal cells in the rabbit (right) as revealed by Neurobiotin injection into one cell in each syncytium. The illustration in turtle retina is from Ammermüller et al, 1996 (84); the rabbit retina illustration is from Mills and Massey, 1994 (67). B. The size of the receptive field of a turtle L-type horizontal cell as determined from the photoresponses that were elicited by concentric light stimuli of different diameters (left). The peak amplitude, normalized to the response to full field illumination (2nd response from the left), is plotted as a function of spot radius in order to derive the length constant (right). The illustration is from Perlman and Ammermüller, 1994 (176). The receptive field of a cat A-type horizontal cell, mapped with a narrow slit of light, is shown in figure 16. Exponential decay of response amplitude flanks both sides of the maximal response, which is elicited when the narrow slit is centered on the studied cell. Note that this maximal slit response is always smaller than the one elicited by a large light stimulus of the same intensity that covers the entire receptive field of the studied cell (Vmax). The red receptive field (Fig. 16A) measures the spatial extent of cat red cone signals, while the blue receptive field (Fig. 16B) measures the spatial extent of rod signals, both signal components occur in the same horizontal cell. These signals share a common center, but differ in space constant. Figure 16. A-type horizontal-cell receptive field in cat retina is mapped with a long narrow slit (100 x 5000 µm). A. The wavelength is 647nm (red) that stimulates a mixture of cat red cone and rod responses. B. The wavelength is 441nm (blue) and dim enough to stimulate only rods. Rod and cone receptive fields share a common center, but differ in size. The continuous curves are generated by the conductive sheet model, with a space constant of 250 μm in A. and 200 μm in B. The figure is from Nelson, 1977 (16). The dimension of the horizontal cell receptive field can be quantified. Using variable diameter spots, one common procedure is to find the minimum spot diameter that elicits a maximal response. Another measure is the receptive-field length constant lambda (λ). For models based on electrical current flow in the horizontal cell layer, lambda is defined as the slit displacement required to reduce response amplitude by 1/e. (16, 167, 169, 170). Some other definitions of lambda based on empirical curve fitting of data have also been suggested (10, 171). For models based on electrical current flow in the horizontal-cell syncytium, receptive field size is directly related to lambda, and lambda is directly related to the membrane resistance of the horizontal cell, and inversely related to the coupling resistance between the horizontal cells. The space constant of the cone signal components in a cat A-type horizontal cell (Fig. 16A) is 250 μm. The space constant for the rod signal component in the same cell is 200 μm (Fig. 16B). This illustrates the point that even in the same cell, depending on what is being measured; somewhat different receptive fields can be inferred. The concept of field size is not monolithic. The exceptional width of horizontal-cell receptive fields finds several uses. First, horizontal-cell actions on photoreceptors and bipolar cells, both of which are much narrower in receptive field centers than horizontal cells, can be seen in the distal limbs of area functions in these narrower-field neurons. Second, horizontal cell types can be distinguished by the size and properties of receptive fields. In the turtle retina, two types of luminosity horizontal cells were early recognized; L1 and L2 (53) or respectively, large receptive field (LRF) and small receptive field (SRF) horizontal cells (81). The L1 (LRF) cells are characterized by receptive fields of large diameter (>3 mm) while the L2 (SRF) cells have a receptive field diameter of about 2 mm. These two L-type horizontal cells also differ with regards to spectral properties (172) and responsiveness to surround illumination (173). The anatomical stains of LRF and SRF cells actually reveals that they are two, electrically isolated, parts of the same cell. LRF is the axon terminal of H1, and SRF is the cell body (Fig. 2a) (53). Thus receptive field measurements add further evidence that a single horizontal cell may have 2 independent area summation regions. The horizontal cell syncytium cannot be fully described by static passive electrical models. The resistances within the horizontal cell layer change with illumination and time and therefore, the size of the receptive field (magnitude of lambda, or the length constant) changes also (169, 174, 175). In general, the size of the receptive-field length constant is related to the intensity of the light stimulus used to measure it (16, 167, 172, 176, 177). When the irradiance of the ambient illumination is increased, the length constant first increases to a peak value and then decreases (16, 169, 175). The spatial properties of C-type horizontal cells in the turtle retina depend upon the color of the light stimuli (91, 178). The waveform of the photoresponses of C-type horizontal cells may change dramatically when the spatial pattern of the light stimulus is changed, especially when the wavelength of the light is close to the zone where response polarity reverses (91). This is because depolarizing and hyperpolarizing mechanisms may differ in size. In isolated pairs of horizontal cells, coupling current decreases somewhat over time (179), potentially introducing another time-dependence in receptive fields. A further receptive field size dependency is introduced by neuromodulators such as dopamine (see below). Horizontal cells are post-synaptic to photoreceptors, but are also pre-synaptic, forming a feedback loop. Horizontal cells send wide-field visual signals back to the narrow center mechanism of cones through these feedback pathways (180-186). The effects of these pathways is revealed by adjusting the size, shape and color of the light stimuli used to evoke responses from cones. The effects of area and brightness on cone photoresponses from the retina of the tiger salamander are shown in figure 17 (183). Each pair of responses was elicited by light stimuli of the same intensity but different size. The early ON-phase of each pair of photoresponses (initial hyperpolarization) is identical regardless of the size of the stimulus, but the later phases are considerably affected by the stimulus size. With a small spot stimulus, following the initial hyperpolarization, the cell slightly recovers towards the dark potential but the membrane potential is maintained at a hyperpolarized level for the entire duration of the stimulus. When a large spot stimulus is used, a significant depolarization is seen after the initial hyperpolarizing phase (arrows in Fig. 17). This result appears independent of stimulus intensity. The late depolarizing potential reflects the activation of the negative feedback pathway from the horizontal cells to cones. Feedback effects are particularly large when cone intracellular chloride concentrations are artificially elevated (183, 185). Figure 17. The contribution of the feedback pathway from L-type horizontal cells to cone responses in the retina of the tiger salamander. Cone photoresponses were elicited by light stimuli of different intensities covering a small or a large spot as indicated. The illustration is from Lasansky, 1981 (183). In turtle retina, the feedback pathway from horizontal cells to cones can be revealed by experiments examining the effects of size and color on cone responses (Fig. 18). With small spots, red and green light stimuli can be adjusted in brightness until equal amplitude hyperpolarizations are elicited from red and green cones. With these small-spot stimuli, the photoresponses of the red cone are very similar in shape, regardless of wavelength (upper pairs of responses). However, when the same two wavelengths of light stimuli were increased in diameter, the excitatory input from the green cones to the L1-type horizontal cells activated the feedback pathway, and caused the response of the red cone to the green light stimulus to become transient and biphasic (Fig. 18, lower left pair). In the green cone, the contribution of the feedback pathway from the red-cone input to L1-type horizontal cells is even more pronounced, and a depolarizing photoresponse is elicited in the green cone with a large diameter red-light stimulus (Fig. 18, bottom right pair). Blue cones also receive feedback signals from L-type horizontal cells (187) as shown in figure 18 (right hand traces). A large diameter red light stimulus was used to selectively isolate possible inputs that were mediated by these feedback pathways. In the dark-adapted state, a small depolarizing after potential is seen following the initial hyperpolarizing phase (trace 1). During a red background light, that selectively desensitized the red cones (L-cones), a pure hyperpolarizing photoresponse was elicited by the red light stimulus (trace 2), while a blue background augmented the relative contribution of the feedback pathway and therefore a depolarizing photoresponse was obtained (trace 3). These and other anatomical and physiological studies provide the basis for proposing that a feedback model between cones and horizontal cells could underlie color opponency (37, 42, 86, 188). Figure 18. The contribution of negative feedback from L-type horizontal cells to the photoresponses of cones in the turtle retina. Red and green cones were stimulated with either small field or large field stimuli of either red or green light. The contribution of the negative feedback from the L-type horizontal cells was most apparent in the recording from the green cone stimulated with a large field red light stimulus. The illustration is from Perlman et al., 1985 (172). The blue cone from the retina of the turtle (Mauremys caspica) was stimulated with a red (700nm) light stimulus covering a large retinal area in the dark-adapted state (trace 1) and during red (trace 2) or blue (trace 3) background lights. Depolarizing feedback signals from red cone stimulation are most apparent on the blue background (trace 3). The illustration is from Itzhaki et al., 1992 (187). While mammals lack color opponent horizontal cells, color opponent responses are seen in primate short-wavelength cones (blue cones) (185). With short-wavelength stimulation, primate blue cones produce outward currents in response to the closing of outer-segment cation channels by phototransduction. But long-wavelength stimuli evoke inward currents (Fig. 19A). The primate blue cone, then, is similar to the turtle blue cone in exhibiting negative feedback from long-wavelength-selective L-type horizontal cells. 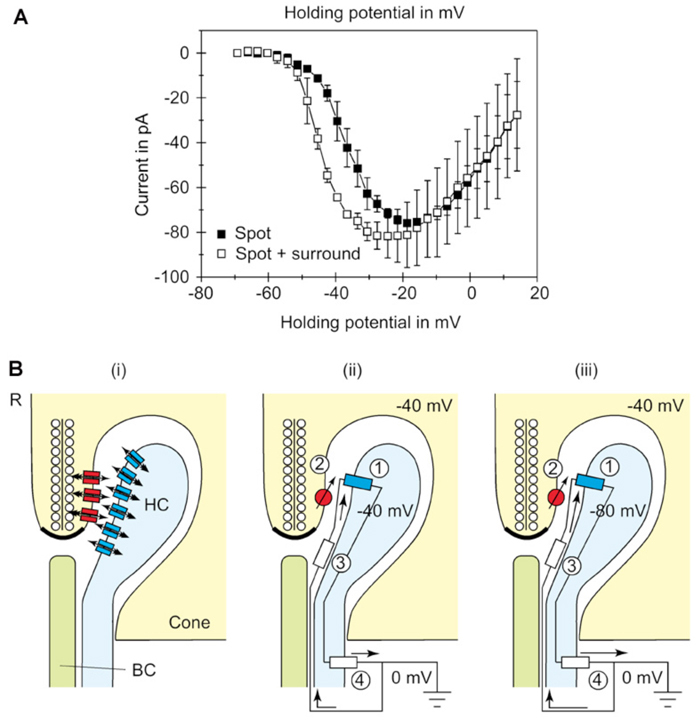 The long-wavelength inward currents, the feedback responses, are abolished by CNQX, an antagonist of horizontal-cell AMPA/kainate membrane channels (Fig. 19B), supporting the notion that horizontal cells are the source of the negative feedback input in cone photoreceptors. Further, the characteristics of blue-cone feedback currents resemble those of calcium currents (185), supporting the long-held idea that horizontal-cell feedback to cones operates through a modulation of calcium channels (183, 189). Figure 19. 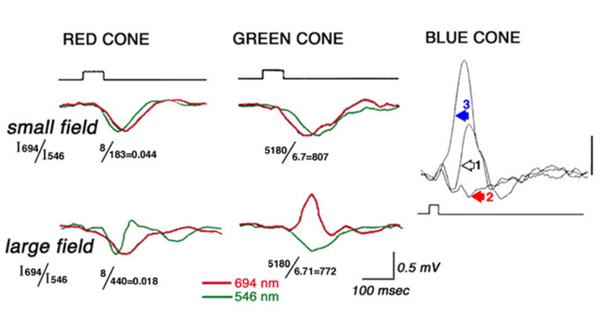 In monkey retina, inhibition of blue cones by long wavelength light is mediated by horizontal cell feedback. A. Short-wavelength blue light evokes outward photocurrents in the blue cone, but long-wavelength yellow light evokes inward feedback currents. B. Inward feedback currents elicited by long-wavelength stimuli are blocked by 20µM CNQX, a blocker of horizontal-cell light responses. Blue cones are voltage clamped at -40mV. The figure is adapted from Packer et al., 2010 (185). Thus, in primate retina there are color opponent blue cones, but not color opponent horizontal cells. The difference with other vertebrates would appear to reside with horizontal cell circuitry. While the H2 cell of primate retina is somewhat blue cone selective (Fig. 10), it apparently is not selective enough to reveal the blue-cone depolarizing feedback signals to red stimuli. The direct hyperpolarizing long-wavelength cone input to H2 cells may mask the blue-cone feedback response. The negative feedback circuit from horizontal cells to cones is thought to occur at the horizontal-cell lateral elements that invaginate photoreceptor terminals at the triad ribbon synapses (Fig. 3a). The problem has been that no images of a synapse with presynaptic vesicle clusters has ever been seen within the lateral elements, except for human retina (190), and there it was only noticed for axon terminal invaginations within rod spherules. However syntaxin-4, a SNARE protein involved in fusion of synaptic vesicles to the plasma membrane, has been localized to the lateral elements of mouse horizontal cells in both cones and rods (Fig 20) (191), as has VGAT, the vesicular GABA transporter (Fig. 21) (192). These molecules both suggest presynaptic activity in horizontal cells. Further, fish retinas have distinctive spinules on the dendritic endings of the horizontal-cell lateral elements in cone pedicles (Fig. 3b). Spinules may be the sites of feedback from horizontal cells to cones because they change shape and enlarge during background illumination when the effects of negative feedback are most apparent (57, 58, 193-196). Figure 20. Electron microscopy of immunolabeled mouse retina demonstrates localization of syntaxin-4 (black granular staining) to the lateral elements of horizontal cells (Hc) in rod (A and B) and cone (C and D) ribbon synapses (arrow heads). Syntaxin-4 occurs in one or both lateral elements. The immunolabel is seen also in horizontal-cell axons and dendrites. The scale bar is 0.5 μm for A–D. The figure is from Hirano et al., 2007 (191). There are several candidates for the feedback neurotransmitter. In cyprinid retinas H1 horizontal cells transport GABA, which accumulates in the cytoplasm (47, 51, 162, 197, 198). GABA-induced currents can be recorded from the terminals of red-sensitive and green-sensitive cones isolated from the turtle retina (199, 200). Color opponency in fish C-type horizontal cells is eliminated upon exposure to GABA or its antagonists (201, 202). However, studies in other species have failed to show GABA effects that are supportive of a role for GABA as the inhibitory feedback neurotransmitter of the horizontal cell. GABA did not eliminate C-type responses in turtle (203) or Xenopus (89), and did not affect cone surround responses in monkey (204). In L-type horizontal cells of turtle, catfish, skate and goldfish retinas, GABA and related drugs induce depolarizations that are consistent with the activation of electrogenic GABA transporters in the horizontal cell membrane (149, 159, 160, 203, 205). Although these cells clearly have GABA uptake systems and accumulate GABA, the idea that GABA mediates the negative feedback of horizontal cells to cone photoreceptors has not received universal experimental validation. Horizontal-cell GABA could still have a feed-forward action directly upon bipolar cell dendrites or other horizontal-cell processes (156, 205). Alternatively GABA receptors on horizontal cells might simply serve the purpose of limiting transporter-generated membrane depolarizations in the presence of extracellular GABA. Figure 21. 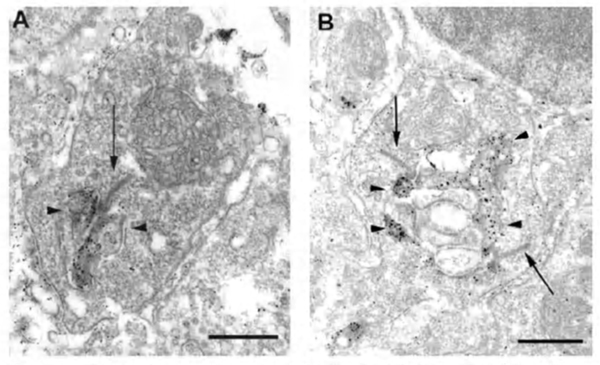 Electron microscopy shows immunolabeling (dark granules) for vesicular γ-aminobutryric acid transporter (VGAT) in mouse (A) and rat (B) horizontal cell lateral elements (arrow heads) in rod spherules. Rod synaptic ribbons are indicated by long arrows. The scale bars are 0.5 μm. The illustration is from Cueva et al., 2002 (192). A further feedback model proposes that elevated proton concentration in the synaptic cleft mediates feedback by inhibiting photoreceptor calcium channels (206). Proton buffers, particularly amino sulfonates like HEPES, block feedback (207-212). While there is general agreement that some pH buffers block feedback, there is currently disagreement whether alteration of pH in the synaptic cleft is the mechanism (213, 214). Most feedback models propose that modulation of presynaptic calcium channels in the photoreceptor terminals is the key. Using voltage-clamp recordings from cones during illumination with spots or annuli of light, Verweij et al (1996) (215) suggest that feedback modulates the voltage-dependency of the calcium channels in the cone pedicles (Fig. 22A). The explanation takes off from an old electrical model (5) and proposes that horizontal cells can initiate large extracellular current flow through hemi-gap-junction channels into the restricted extracellular space within the triad synapse of the cone (Fig. 22B) (68, 70, 72, 189, 216). During light stimulation, the L-type horizontal cells hyperpolarize, increasing the magnitude of the inward flow of cations from extracellular space, through hemi-gap-junction channels, into horizontal cell lateral elements. This causes hyperpolarization of the extracellular space. Such hemi-gap-junctions, consisting of connexin Cx55.5, have been demonstrated anatomically in horizontal cell lateral elements in zebrafish retinas (Fig. 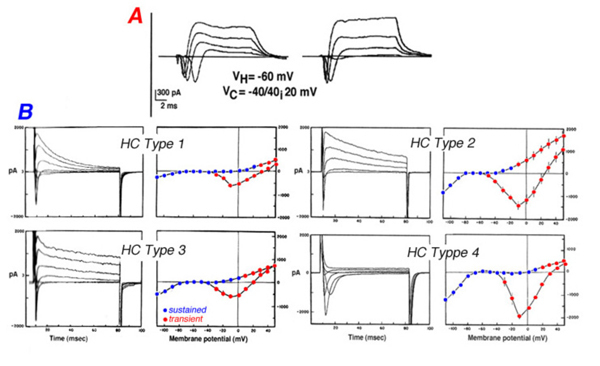 3d).The extracellular hyperpolarization activates voltage dependent calcium channels which sense the change in the same way as intracellular depolarization, leading to calcium entry, and an increase in glutamate release. The idea finds some support because when the hemi-channels are blocked with carbenoxolone (a specific gap junction blocker), the feedback signal in the cone is eliminated (189, 204). Figure 22. Electrical feedback model. A. The activation range of calcium currents in cone synaptic terminals shifts towards more hyperpolarized values during surround stimuli that hyperpolarize horizontal cells. B. The electrical or ‘ephaptic’ feedback model argues that the voltage within the enclosed extracellular space surrounding horizontal-cell invaginated dendritic tips is influenced by horizontal-cell membrane polarization. With surround stimulation, these dendrites hyperpolarize, causing extracellular space to hyperpolarize also. This affects synaptic calcium channels in the same way as would intracellular depolarization of the cone terminal. The more hyperpolarized the horizontal cell dendrite, the more calcium enters the cone terminal, and the more neurotransmitter is released. The effect is opposite to the light-induced closing of cone outer segment cation channels that suppress neurotransmitter release. (i) Calcium channels (red) are located on the cone presynaptic membrane, adjacent to the ribbon. Gap junction hemichannels (blue), polarize adjacent extracellular space. Extracellular current flow hyperpolarizes extracellular space to a greater extent in the light (ii) than in the dark (i) The illustration is from Kamermans and Fahrenfort, 2004 (216). Further evidence for the importance of connexin 55.5 and hemi gap-junctions for feedback comes from a genetic knockout in zebrafish. Feedback to cones, behavioral contrast sensitivity, and horizontal-cell color opponency were all weakened in this knockout. As this connexin is only expressed in horizontal cells, a perturbation of horizontal-cell circuitry is a likely cause. Curiously the knockout effects were strongest when horizontal cells were in a hyperpolarized state, but were less evident when they were in a depolarized state (73). The properties of horizontal cells are altered by a variety of humoral factors released by retinal cells during changing conditions of illumination. These chemicals, generally referred to as neuromodulators, are believed to adjust the modes of information processing in the retina in order to match retinal function to ambient condtions. Neuromodulators reach horizontal cells either via direct synaptic interactions or by volume transmission. In the latter mode, inter-cellular communication is mediated by passive diffusion of the chemical following its release from the source cells into extracellular space. Dopamine is the most extensively studied retinal neuromodulator, but in recent years nitric oxide and retinoic acid have been added to the list. In this section the actions of these neuromodulators on vertebrate horizontal cells is discussed. Dopamine-containing neurons reside in the amacrine cell layer of the retina. In fish, where they were first discovered, dopaminergic cells are interplexiform cells (IPCs), having cell bodies in the amacrine cell layer and sending long processes to the outer plexiform layer where they arborize and synapse on horizontal cells. In other species (e.g. turtle, most mammals), the dopaminergic cells are amacrine cells with few, if any, processes extending to the outer plexiform layer (217), and therefore dopamine has to reach the horizontal cells by volume diffusion through the inner nuclear layer. The action of dopamine upon vertebrate horizontal cells has been extensively studied and reviewed (218) and involves at least 4 distinct actions. (1) Dopamine reduces the extent of gap-junction coupling, as shown by dye coupling experiments, by electrophysiological determination of receptive field size (119, 166, 176, 219-222), and by patch recordings from isolated cell pairs (69). Dopamine shrinks the receptive field, and reduces photoresponse amplitude in horizontal cells from intact fish retina (Fig. 23A). Photoresponses that were recorded during superfusion with dopamine solutions were larger in amplitude with small spot stimuli than those recorded with the same stimuli under control conditions (Fig 23A). The increase in the response to spot stimuli indicates less shunting by neighboring non-illuminated horizontal cells and is consistent with the notion that dopamine uncouples the horizontal cell network (220). Gap junction conductance is reduced through activation of adenylate cyclase by dopamine D1-type receptors (223). Figure 23. Dopamine affects synaptic gain and receptive fields in fish horizontal cells. A. Photoresponses were recorded from a horizontal cell in the intact carp retina using light stimuli of fixed intensity but different diameter, under control conditions and after exposure to dopamine. The illustration is from Mangel and Dowling, 1985 (220). B. Dopamine by itself did not elicit any current response in a horizontal cell isolated from white perch retina (upper trace). However in the presence of dopamine the inward current elicited by the AMPA/kainate agonist kainic acid (middle trace) was significantly augmented (bottom trace). The illustration is from Knapp and Dowling, 1987 (227). By reducing gap-junction coupling, dopamine limits the spread of Neurobiotin, a low-molecular weight (323 Dalton) tracer molecule, after injection of this molecule into a cell within the horizontal cell layer. In H1 cells of monkey retina the Neurobiotin tracer field is maximal during dark adaptation (Fig. 24A). The dopamine D1 agonist SKF38393 reduces the size of the tracer field (Fig. 24D), as does light adaptation (Fig. 24B) and the gap junction blocking agent meclofenamic acid (Fig. 24C). 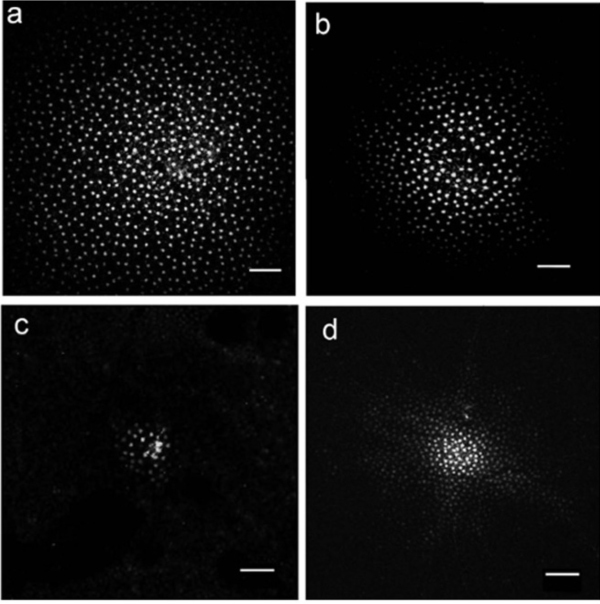 Dark adapted space constants in monkey H1 cells are very large, in excess of 1000 μm (222). Similar results are seen in mouse retina where additionally, blockade of the dopamine D1 receptor with a D1 antagonist (SCH23390) widens the area of tracer spread, and the cAMP analogue 8-bromo cyclic GMP reduces the spread of the tracer. All observations are consistent with a D1 receptor, cAMP-mediated mechanism (224). Figure 24. Modulation of horizontal-cell coupling in monkey retina. a. Neurobiotin tracer reveals maximal coupling-field occurs in H1 horizontal cells under dark adaptation. b. Mesopic (500 nm) background illumination shrinks the coupling field. c. Meclofenamic acid, a gap junction blocking agent, prevents tracer spread. d. The dopamine D1 receptor agonist SKF38393 greatly reduces the spread of tracer. The scale bars are 100 μm. The illustration is from Zhang, Jacoby and Wu, 2011 (222). Receptive field modulation by dopamine varies somewhat with species. Neurobiotin spread between rabbit A-type cell bodies is highly pH sensitive (165), in fact only observable at pH 7.2 +/- 0.05. 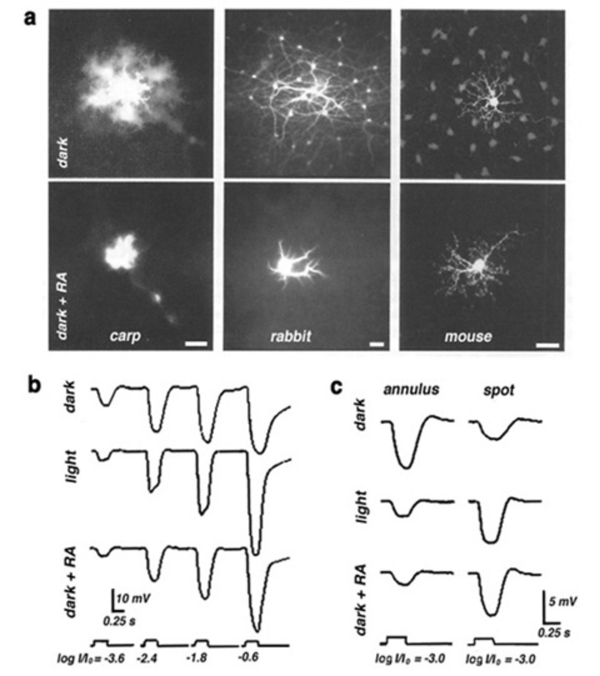 Nonetheless, a particularly striking modulation of receptive field size occurs in the axon terminal systems of rabbit B-type horizontal cells (233). Modulation of tracer coupling by dopamine is robust in mouse retina (224) and in monkey retina (Fig. 24) (222). Tracer coupling between the rod-driven horizontal cells of skate retina was dopamine insensitive (234). In isolated horizontal cell pairs dopamine uncouples gap junctions (69). In this preparation the biophysics of gap junction coupling and its modulation by dopamine can be examined in detail. In zebrafish the unitary conductance of a gap-junction channel is 50-60 pS and the open time is ~10 msec. Dopamine reduces the open time and the frequency of opening of these channels for a net reduction of 2-3 fold (235). The action is mediated through a D1 agonist and is mimicked by the cAMP analogue 8-Bromo-cAMP, suggesting an intracellular mechanism that involves increases in cAMP, a common action of D1 receptors (179). A parallel study in isolated catfish horizontal-cell pairs yielded similar results. Dopamine D1 receptors raised intracellular cAMP, closing gap junctions. Further, intracellular pH and Ca2+ ions were ruled out as mediators (236). (2) Dopamine induces the formation of spinules in fish horizontal cells in a manner similar to that seen with bright-light background illumination (193, 225). (3) In fish retina, dopamine reduces the amplitude of horizontal-cell photoresponses (220, 226), as shown in figure 23A. This phenomenon is attributed to dopamine modulation of the interaction between L-glutamate and AMPA/KA receptors on the horizontal cell membrane. Dopamine increases the binding of L-glutamate to horizontal-cell-membrane receptors (227), as illustrated in figure 23B. Dopamine by itself evoked no current in the isolated horizontal cell (Fig. 23B, upper trace), but it significantly augmented the kainate-induced glutamate-receptor current (Fig. 23B, lower traces). Further studies show that this dopamine action is dependent on extracellular magnesium ions (228). In the intact retina, the photoresponses of horizontal cells reflect the unbinding of glutamate from its receptors. If dopamine increases the affinity of glutamate for its receptors on the horizontal cell membrane, then unbinding at light onset will be at a slower rate. The flicker photoresponses of cat and rabbit horizontal cells were in fact phase-delayed by both D1 and D2 selective dopamine agonists, in agreement with the idea of slower unbinding of glutamate. In these species flicker photoresponses increased in amplitude with dim lights, but decreased with bright lights (229). Pflug et al (229) suggest that the dopamine-induced increase in glutamate binding by horizontal cells may induce a maintained depolarized bias that shifts cone calcium activation through feedback interaction towards more depolarized levels, tending to facilitate dim-stimulus synaptic transmission, while truncating bright-stimulus transmission (229), an elaboration of the ideas put forward by Mangel and Dowling (230). In other species this appears not to be the case. Such modulations are not clear in the turtle retina (176, 221). (4) Dopamine changes the balance between rod and cone inputs to horizontal cells in Xenopus retina, in order to augment the rod contribution in the dark-adapted state and the cone contribution in the light-adapted state. This action is thought to depend on different dopamine sensitivities of AMPA/KA receptors postsynaptic to rods and cones (231, 232). Involvement of nitric oxide (NO) in physiolological regulation of retina is indicated by the presence of cells containing the enzyme nitric oxide synthase (NOS) that synthesizes NO from L-arginine (237). Immunoreactivity to NOS isoforms or demonstration of NADPH-diaphorase activity has been seen in every vertebrate retina studied (238). In all species NOS occurs in some types of amacrine cells, but reports of NOS in photoreceptors, horizontal cells, bipolar cells and Müller cells have also been published. In fish retinas, evidence for NOS in horizontal cells has been demonstrated by immunostaining and NADPH diaphorase histochemistry (239-241). In the turtle retina, n-NOS has been reported in horizontal cell processes at photoreceptor ribbon synapses and in the inner segments of the photoreceptors, and e-NOS has been seen in the H1 cell axon terminals and in Müller cells (47, 242-244). In the rabbit retina, NADPH diaphorase activity, an indicator for NOS presence in horizontal cells, has been shown to depend upon the state of adaptation and the activity of glutamatergic pathways. It is increased in the dark-adapted state (245) or by the activation of AMPA/KA type receptors (246). Indeed nitric oxide has been suggested as a player in horizontal-cell feedback mechanisms (247). Regardless of the exact cellular source of NO, this molecule exerts profound effects on the physiology of horizontal cells. Raising NO level by either exogenous application (NO donors) or by adding L-arginine, the substrate for its synthesis, reduces the size of the horizontal cell receptive field (177, 248, 249). This effect reflects direct action of NO on the gap junctions between adjacent horizontal cells. It is thought to be mediated through cGMP-dependent protein kinase pathways (249, 250), in a pathway parallel to cAMP, dopaminergic modulation. 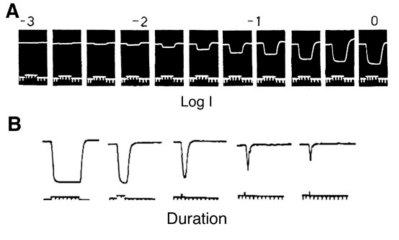 NO modifies the photoresponses of both A-type and B-type horizontal cells in the rabbit retina (Fig. 25). These responses were elicited by a series of disks of fixed intensity and different radii, both in control conditions and during exposure to SNAP (an NO donor). For every light stimulus, the photoresponse is larger during SNAP application as compared to control conditions (gray vs black responses, Fig.25). This is illustrated graphically in figure 25B and 25D where the peak responses of photoresponses shown in parts A and C respectively are plotted as a function of stimulus diameter. 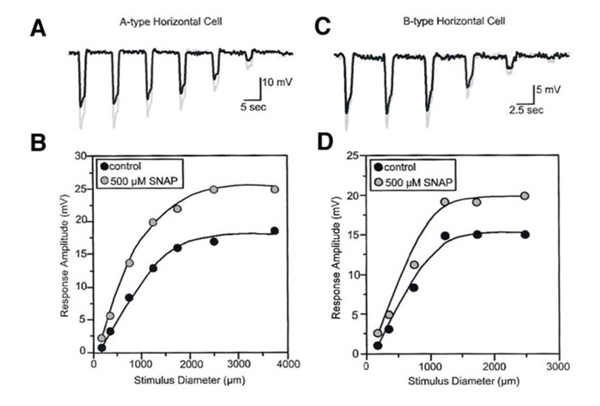 SNAP clearly causes augmentation of the photoresponses to large diameter stimuli. NO acts in the distal rabbit retina to augment the photoresponses of the horizontal cells and to reduce the receptive field size (249). Figure 25. The actions of nitric oxide (NO) upon the physiology of horizontal cells in the rabbit retina. A. & C. The effects of NO were tested by adding SNAP, an NO donor, and observing the effects upon photoresponses that were elicited by disks of fixed intensity but different diameters. B. & D. The relationship between response amplitudes and stimulus diameters indicates that NO augments the photoresponses of both A-type and B-type horizontal cells and reduces their receptive field sizes (black traces, control; gray traces, SNAP). The illustration is from Xin and Bloomfield, 2000 (249). A similar augmentation of horizontal-cell responses by NO has been seen in L-type horizontal cells of carp (177) and turtle retinas (251). The NO effect in horizontal cells can reflect either NO action upon the phototransduction process in the photoreceptor outer segments (251, 252) or upon the neurotransmitter release from the photoreceptors (253). Furthermore, NO can modulate the interaction between L-glutamate and its receptors on the horizontal cell membrane (254), and thus can alter the responsivity of horizontal cells independently of effects upon phototransduction. In order to distinguish the above possibilities, the influence of NO-related drugs on the transfer function between cone photoreceptors and L1-type horizontal cells (L1-HC) were studied in the turtle eyecup preparation as shown in figure 26 (251). In the dark-adapted state (Fig. 26A), the cone to L1-HC synapse is non-linear and is characterized by high amplification for dim light stimuli that elicit low amplitude cone photoresponses. Reducing the retinal level of NO by adding L-NAME, increased this non-linearity, while raising retinal NO level by adding either L-arginine or SNP, reduced the non-linearity and linearized the cone-to-horizontal cell transfer function. In the light-adapted state (Fig. 26B), the cone to L1-HC transfer function was linear under control conditions consistent with high NO level. Further increase of retinal NO (adding L-arginine or SNP) did not change the transfer function or synaptic amplification, while lowering retinal level of NO (adding L-NAME) changed the transfer function into a non-linear one with high amplification for small amplitude cone photoresponses. What is clear in figure 26 is a direct effect on synaptic transfer from cones to horizontal cells. This may include neurotransmitter release and/or neurotransmitter interactions with its post-synaptic receptors. Figure 26. The effects of nitric oxide (NO) upon transfer function and synaptic amplification between cone photoreceptors and L1-type horizontal cells in the turtle eyecup preparation. The transfer function and synaptic amplification were calculated by comparing the mean photoresponses of L1-horizontal cells to those of cones for each recording condition. A. In the dark-adapted state, the transfer function under control conditions is non-linear (open circles) having highest synaptic amplification for small amplitude cone photoresponses, elicited by dim light stimuli. Lowering retinal NO level by adding L-NAME, increased non-linearity (open squares), while raising retinal NO level, by adding L-arginine or sodium nitroprusside (SNP), linearized the transfer function and made synaptic amplification independent of cone response amplitude (triangles and inverted triangles respectively). B. The control light-adapted transfer function is linear having constant synaptic amplification for the entire range of cone photoresponses (open circles). Raising retinal NO level (L-arginine – triangles; SNP – inverted triangles) had no effect, while lowering retinal NO level (adding L-NAME) transformed the transfer function into a non-linear function having highest synaptic amplification for small amplitude cone photoresponses (open squares). The figure is adopted from Levy et al., 2004 (251). In contrast to dopamine, NO does not influence the process of spinule formation in fish horizontal cells during exposure to background lights (177). Retinoids are of great importance in the eye having roles in both the photopigment cycle and in the embryonic development of the eye. The retinoid 11-cis retinaldehyde serves as the chromophore of the rhodopsin molecule, the visual pigment of the vertebrate photoreceptors (255, 256). The retinoid retinoic acid activates transcription factors which are important during eye development (257-260). Most recently a further role for retinoic acid has been proposed; that of a neuromodulator linked to background adaptation, affecting horizontal cells in particular (64, 65, 261). Retinoic acid is produced in the pigment epithelium as a side effect of the rhodopsin transduction process in bright illumination. Retinoic acid induces synaptic plasticity at the terminal dendrites of horizontal cells and promotes the growth of spinules in fish horizontal cells, in a pattern similar to that induced by background lights (64, 65). It exerts a pronounced effect on the electrical coupling between horizontal cells in mammalian and non-mammalian retinas and reduces the receptive fields of the horizontal cells (261, 262) as shown in figure 27. Adding retinoic acid to retinal preparations of carp, rabbit and mouse, reduces the conductance of the gap junctions between neighboring horizontal cells thus reducing the degree of dye coupling (Fig. 27a), in a manner similar to that seen during background illumination. Intracellular recordings in horizontal cells also show that retinoic acid produces effects similar to those of light adaptation. The amplitudes of the horizontal cell photoresponses to full field stimuli are increased by retinoic acid (Fig. 27b). The responses to stimulation with bright light annuli are reduced by retinoic acid, and those to spot illumination are increased (Fig. 27c). Thus, retinoic acid, like dopamine and nitric oxide, seems to modulate the physiological properties of vertebrate horizontal cells in order to adjust their function during changing conditions of ambient illumination. Figure 27. The effects of retinoic acid upon the physiology of horizontal cells in different species. a. In carp, rabbit and mouse retinas, retinoic acid added in the dark-adapted state reduced the extent of dye coupling. b. Retinoic acid added in the dark-adapted state exerts effects similar to those of light adaptation by augmenting the photoresponses of fish horizontal cells. c. Retinoic acid, like background illumination, reduces the response to an annulus stimulus and augments that to a spot stimulus in fish horizontal cells. The illustration is from Weiler et al., 2001 (261). The major functional roles of horizontal cells in the vertebrate retina are 1) initiating the organization of spatially opponent receptive fields for second and third order neurons in the retina, 2) modulation of the photoreceptor signal with different lighting conditions and 3) adjustment of synaptic gain. These roles represent both neuronal signal processing and neuronal adaptation at the first synaptic level in the retina. In the half century since Svaetichin (80, 263) first described S-potentials in the vertebrate retina, we have made progress in our understanding of the many ways that horizontal cells can influence the kinetics and spatial organization of the photoreceptor response, and as a consequence, the physiology of all downstream retinal neurons. These include rod-cone balance changes, distal color opponency, center surround opponency, and gain regulation at the photoreceptor synapse. Further, the horizontal cell itself is under neuromodulatory control, and reorganizes its synaptic connections, glutamate sensitivity, and receptive field under the influence of dopamine, retinoic acid and nitric oxide. The horizontal cell forms an important link between inner and outer retina because this cell type controls distal retinal signal processing, while being itself under the influence of centrifugal neuromodulatory control from both within the retina and even from the brain itself. Calcium entry into synaptic structures induces the release of neurotransmitter by promoting fusion of neurotransmitter-laden synaptic vesicles with the presynaptic membrane. Calcium enters through specialized membrane channels regulated by voltage, by second messengers, and by neurotransmitters. In the ephaptic model for horizontal cell modulation of gain at cone synapses (189, 215, 216), depolarized, dark-adapted horizontal cells produce an electrical gradient in the extracellular space that reduces the rate of calcium entry into cone terminals. This in turn, reduces the rate of neurotransmitter release (Fig. 22B). Background illumination hyperpolarizes horizontal cells, increases the extracellular currents, shifts the voltage dependency of the calcium channels in the cone terminals to more hyperpolarized levels (Fig. 22A), and increases the rate of transmitter release for a given potential of the cone as compared to the rate of release in the absence of horizontal cell feedback. Light-evoked hyperpolarization of horizontal cells increases neurotransmitter release from cones, while light evoked hyperpolarization of cones depresses the same release. Horizontal-cell modulation of transmitter release from cones serves to complete a negative feedback loop between horizontal cells and cones. This in turn regulates the horizontal cell membrane potential. When horizontal cells become depolarized, calcium influx into the cone synapse is reduced, as is transmitter efflux from the synapse. The effect sends horizontal cell membrane potential in a hyperpolarized direction. Thus horizontal cell membrane potential becomes controlled by the network, rather than strictly by factors intrinsic to the cell itself. Horizontal cells do not express overt center-surround organization of their receptive fields; however, they do express color opponency, a very likely result of their own feedback. This is discussed in the section Physiological types above. Horizontal-cell receptive fields also show evidence of spatial effects from their own feedback circuitry. Small spot responses from horizontal cells are increased in amplitude and quickened in time course when a feedback-stimulating annular background is added (Fig. 28). In the illustration (264) small-spot, white-noise stimuli are used to calculate impulse functions under conditions where the spot is presented either with, or without an annulus. The white noise impulse function provides a very accurate depiction of changes in response dynamics. It is clear that the gain of the small spot response is increased, and the temporal tuning of the response is changed to higher frequencies and shorter latencies in the presence of the feedback-stimulating annulus. The increased gain agrees with the idea that an inhibitory feedback influence on photoreceptor synaptic transmission has been removed by the annulus causing greater transmitter release, and consequently greater modulation of that release by light. The change in dynamics is not yet modeled, but it would appear that clearance of glutamate from the photoreceptor synaptic cleft has been accelerated through feedback also. Figure 28. The effects of feedback on horizontal-cell gain and speed. Using small-spot, white-noise stimuli, impulse functions were calculated for horizontal-cell light responses. S is the impulse function for the spot stimulus alone. S/A is the impulse function for the spot stimulus with additional maintained annular stimulation in the surround to stimulate feedback. In the presence of an annulus the peak time of the spot impulse function shortens, the amplitude increases, and the shape becomes biphasic or differentiating. A. Turtle horizontal cells. B. Catfish horizontal cells. In each case results are superimposed for 4 different horizontal cells. The illustration is from Chappell, et al., 1985 (264). The illustrated effect (Fig. 28) is shown for turtle and catfish horizontal cells (264), but has also been reported in Xenopus, mudpuppy and cat horizontal cells (168, 265, 266). In these latter species horizontal cell responses contain mixed rod and cone signals. In these species it is particularly rod-selective wide-field stimuli that are effective in increasing the amplitudes of cone-driven spot responses and shortening their latencies (168, 265, 266). The effect is thought to be analogous to ‘suppressive rod cone interaction’ (SRCI), a behavioral paradigm where dim rod backgrounds make flickering, cone-selective, small spots more visible (267). 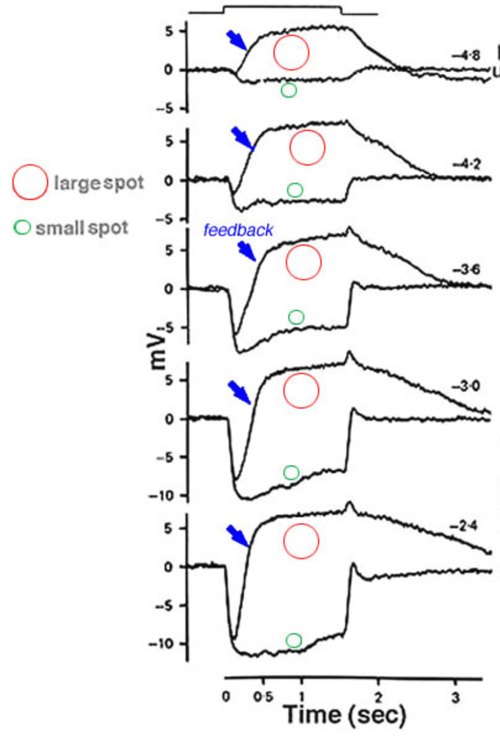 These observations suggest that feedback provides more than just wide field inhibition of cones, it also regulates synaptic gain and response dynamics. Bipolar cells respond with opposite voltage polarity to light stimuli illuminating either the center or the surround (4, 268). Bipolar cells perceive horizontal-cell negative feedback and synaptic gain modulation as spatial opponency. This is true for both ON- and OFF-center bipolar cells. The increase in photoreceptor transmitter release caused by horizontal cell hyperpolarization due to annular light stimuli is just the reverse of the decrease in transmitter release that occurs as cones are hyperpolarized by small spots of light. Thus through horizontal cell feedback onto cones, for bipolar cells, wide field annular stimuli have just the opposite effect as small spot stimuli. Feedback also provides synaptic gain in bipolar cells. Small-spot center responses of bipolar cells, as well as small-spot responses of horizontal cells, are amplified by feedback (265, 269). Horizontal cell feedback is not necessarily the only way of influencing bipolar cell receptive field architecture. Horizontal cells can impinge directly on bipolar cells, feeding visual information forward to these second-order retinal neurons. Typical chemical synapses from horizontal to bipolar cells have been described in non-mammalian retinas (270, 271). In one study, in the presence of APB to block synaptic transmission from photoreceptors to ON-center bipolar cells, the light stimulus induced a hyperpolarizing response in the bipolar cell thus supporting the idea of a direct input, possibly from horizontal cells (123). The best candidate for the feed-forward neurotransmitter is GABA, as seen in experiments on salamander retina (272). Horizontal cells make the GABA synthetic enzyme GAD in one of two isoforms, GAD 65 or GAD 67 (273); and further, in some species, they express uptake systems for GABA (51, 161). GABAA receptors are found postsynaptic to horizontal cells on the dendritic tips of both flat and invaginating bipolar cells in cat, macaque, and human retinas (274, 275). While GABA inhibition from horizontal cells might serve for the antagonistic surround of OFF bipolar cells, GABA excitation would be required for ON-bipolar cells. GABA responses are mediated by the chloride gradient in post-synaptic bipolar cells. This gradient is governed in part by the actions of chloride transporters. The transporter KCC2 localized on the dendritic tips of OFF-center bipolar cells, probably maintains a chloride gradient suitable for GABA inhibition (276). ON bipolar cell dendrites express the chloride transporter NKCC, as do horizontal cells, setting up a chloride gradient suitable for GABAergic excitation. A further potential excitatory pathway for GABA in the distal retina might be provided by GABA transporters. These induce sodium entry, depolarizing, at least, horizontal cells (161, 162), but possibly some bipolar cells as well. Not all bipolar cells exhibit spatial antagonism. The ON-bipolar for the rod system and some OFF-center cone bipolar cells in cat retina appear to lack surrounds (277, 278). Regardless of the exact neuronal pathway, whether feedforward or feedback, it is generally accepted that horizontal cells play an important role in spatial information processing in retinal neurons in the distal retina (3, 4, 171, 279-287). Horizontal cell feedback also serves to generate color opponency in bipolar cells and therefore contributes to the physiology of color-opponent ganglion cells. Figure 29B summarizes, the manner in which single and double opponent bipolar-cell receptive fields can be formed in the fish retina according to the cascade model of color opponency (43, 86, 288). The opponent surround of the single opponent cell is easy to model (Fig. 29B, top). This bipolar cell receives an excitatory input from red cones only and therefore, is defined as a red OFF-center cell. Negative feedback from monophasic and biphasic horizontal cells oppose each other in the red range of the spectrum and strengthen each other in the green and blue range. If the degree of feedback from both horizontal cells is the same, then the bipolar surround will be of an ON pattern with spectral sensitivity highest in the green part of the spectrum. If the feedback from the monophasic horizontal cell is weaker compared to that of the biphasic horizontal cell, then the spectral response of the bipolar cell to surround illumination will be hyperpolarizing for red light and depolarizing for green light (R-G+) (86). Figure 29. Schematic drawing of the horizontal-cell lateral inhibition onto cones that forms the concentrically organized receptive fields of bipolar cells. In (A), a simple feedback from monophasic (L-type) horizontal cells onto cones can affect the hyperpolarizing OFF-center or depolarizing ON-center bipolar cells to provide the opponent ON- or OFF- surround respectively. In (B), the same mechanism can be used to model the generation of color opponent responses in bipolar cells. The drawing illustrates the manner in which biphasic (Bi) chromaticity horizontal cells and monophasic (Mono) luminosity horizontal cells can feed back through a single cone type to give the opponent color surround to a red OFF bipolar cell. In the lower cartoon, red cones provide excitatory input and green cone inhibitory input to produce a red OFF, green ON center double opponent bipolar cell. The red ON and green OFF surround is added by the chromatic (Bi) and luminosity (mono) horizontal cells. The model is adapted from Kamermans and Spekreijse, 1995 (86). In the double opponent bipolar cell (Fig. 29B, bottom), the bipolar cell responds in its center with hyperpolarizations to red light stimuli and with depolarizations to green and blue light stimuli. This central color opponency is generated by different types of inputs from different types of cones; excitatory input from the red cones and inhibitory input from the green cones. Indeed in the retina of giant danio a color opponent cone bipolar cell with bistratified axonal morphology has been found to respond to both AMPA/kainate agonists (OFF type receptors) and to EAAT agonists (ON type receptors) suggesting both ON and OFF dendritic input from spectrally distinct cones (289). If the monophasic and the biphasic horizontal cells feed back onto both spectral types of cone (86), then the feedback through the green cones would work against the feedback through the red cones because of the different synaptic interactions. When the feedback pathways from each horizontal cell onto the red and green cones differ, then color opponency can be generated by the feedback pathways. However, when the strength of the feedback from each horizontal cell to both types of cones is equal, the surround response could be achromatic. Under these conditions, color opponency in the surround of the bipolar cell can occur only through direct input from one or both horizontal cells to the bipolar cell itself. In experiments where horizontal-cell membrane potentials are directly polarized by injections of current through intracellular microelectrodes (Fig. 30), ganglion cell discharges characteristic of ‘surround responses’ or ‘large-spot responses’ are evoked (284, 290). A hyperpolarizing current step injected into a rabbit horizontal cell depresses the firing rate in an ON-center ganglion cell, but increases the firing rate in an OFF-center ganglion cell (Fig. 30). Both actions resemble surround responses. This current-evoked response reflects the negative feedback pathway from horizontal cells to cones and/or direct input from the horizontal cells to bipolar cells. Evidence for both possibilities has been reported. The glutamate agonist 2-amino-4 phosphonobutyrate (APB), a selective blocker for transmission between cones and ON-center bipolar cells, blocks the light responses of ON-center ganglion cells, and also the ‘surround-like’ responses evoked by injection of current into horizontal cells (290). Moreover, sub-millimolar concentrations of cobalt ions selectively block the feedback pathway from horizontal cells to cone photoreceptors. In turtles this results in the absence of surround components in ganglion cells in proximal retina (291). Similarly the feedback blocker HEPES, a cationic buffer which selectively attenuates horizontal-cell area effects in cone responses, blocks the surround responses of parasol ganglion cells in monkey (209). This evidence suggests that a major influence of horizontal cells at the ganglion cell level is through interactions with photoreceptors, that this interaction influences the discharge patterns of ganglion cells, and by extension, plays a very important role in vision and visual perception. Figure 30. Retinal ganglion cells are influenced by current injection into horizontal cells. Horizontal cells were penetrated with intracellular electrodes while extracellular spikes were recorded from ganglion cells close to the horizontal cell recording site. The firing rate of an ON-center ganglion cell was reduced by hyperpolarizing current injection, and increased by depolarizing currents (red, above). The firing rate of an OFF-center ganglion cell was increased by hyperpolarizing currents, and slightly decreased by depolarizing currents (blue, below). The actions mimicked ganglion-cell surround responses. The illustration is taken from Mangel, 1991 (290). 1. Svaetichin G. The cone action potential. Acta Physiol. Scand. 1953;29 Suppl. 106:565–600. 29.Boycott, B.B. and J.E. Dowling, Organization of the primate retina: light microscopy. Phil. Trans. R. Soc., B 1969255: p. 109-184. 31.Cajal, S., The Structure of the retina. In: Thorpe SA, Glickstein M, translators (1972). 1892, Springfield: Thomas. 32.Gallego A. Comparative studies on horizontal cells and a note on microglial cells. Progress in Retinal Research. 1986;5:165–206. 33.Kolb H. Organization of the outer plexiform layer of the primate retina: electron microscopy of Golgi-impregnated cells. Philosophical Transactions of the Royal Society, London, B. 1970;258:261–283. 38.Peichl, L., D. Sandmann, and B.B. Boycott, eds. Comparative anatomy and function of mammalian horizontal cells. Development and Organization of the Retina, ed. L.M. Chalupa and B.L. Finaly. 1998, Plenum Press: New York. 39.Polyak, S.L., The Retina1941, Chicago: University of Chicago. 56.Lipetz, L.E., ed. A model of function at the outer plexiform layer of cyprinid retina. Frontiers of Visual Science. 1978, Springer-Verlag: Berlin-Heidelberg. pp 471-482. 76.Goldsmith T.H. What birds See. Scientific American. 2006;295(1):69–75. 84.Ammermüller J., Kolb H. Functional architecture of the turtle retina. Progress in Retinal and Eye Research. 1996;15(2):393–433. 86.Kamermans, M. and H. Spekreijse, Spectral behavior of cone-driven horizontal cells in teleost retina, in Progress in Retinal and Eye Research, N. Osborne and G. Chader, Editors. 1995, Elsevier Science Ltd. p. 313-360. 87.Kolb, H. and L.E. Lipitz, eds. The anatomical basis for colour vision in the vertebrate retina. Vision and Visual Dysfunction ed. P. Gouras. Vol. 6. 1991, Macmillan Press Ltd.: London. 128-145. 107.Sterling, P., Retina, in The Synaptic Organization of the Brain, G.M. Shepard, Editor. 1990, Oxford University Press: New York. p. 170-213. 175.Borenstein, O., Lateral spread of electrical signals in the horizontal cells layer of the turtle retina 1999, Technion-Israel Institute of Technology: Haifa. 196.Kirsch M., Djamgoz M.B., Wagner H.G. Correlation of spinule dynamics and plasticity of the horizontal cell spectral response in cyprinid fish retina: quantitative analysis. Cell & Tissue Research. 1990;260(1):123–130. 260.Dräger U.C., McCaffery P. Retinoic acid and development of the retina. Progress in Retinal and Eye Research. 1997;16(3):323–351. 283.Naka K. Neuronal circuitry in the catfish retina. Invest Ophthalmol. 1976;15(11):926–935. 287.McReynolds, J.S. and P.D. Lukasiewicz, eds. Integration of synaptic input from on and off pathways in mudpuppy retinal ganglion cells. Neurobiology of the Inner Retina, ed. R. Weiler and N.N. Osborne. Vol. H31. 1989, Springer-Verlag: Berlin, Heidelberg. 209-220. 288.Stell W.K. 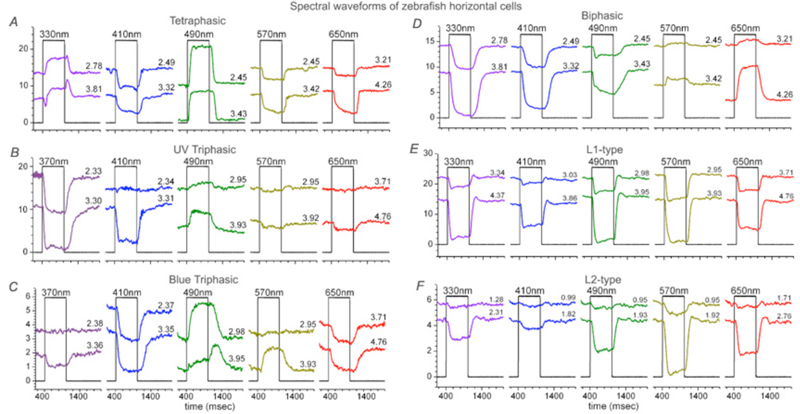 Functional polarization of horizontal cell dendrites in goldfish retina. . Invest Ophthalmol. 1976;15(11):895–908.